Having survived the rental market in New York for the better part of these last few years, I’ve heard the term thrown around by rental agents and plastered across buildings from Wall Street to Harlem. Laminate hardwood floors? Luxury! 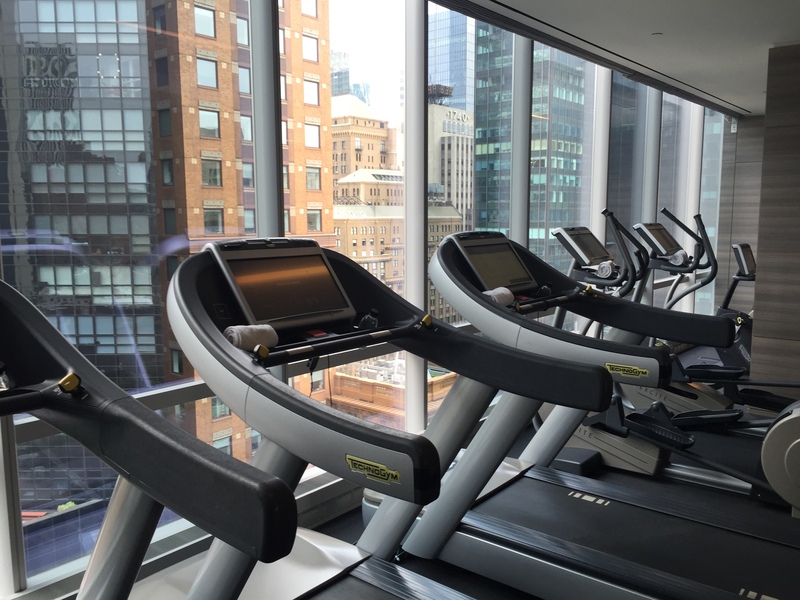 A few treadmills stuffed into a damp, airless room? Luxury! Maintenance requests fulfilled in a timely manner? Trust me, that can be a luxury too. 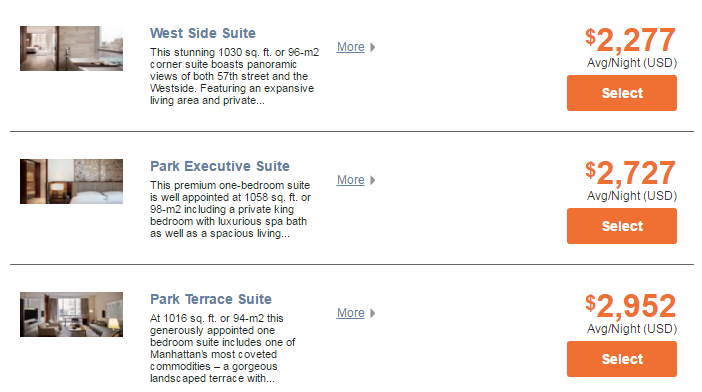 With the term so aggrandized to be meaningless, how can we tell if we’re staying at a “luxury” hotel? Is it as simple as counting stars? Maybe dollar signs are a more accurate measure. Can we count on all the Ritz Carltons and Mandarin Orientals of the world to deliver a true luxury experience? What makes a hotel stand out from the sea of five-star hotels around the world? With my time in New York coming to a close, it was fine time to find out. 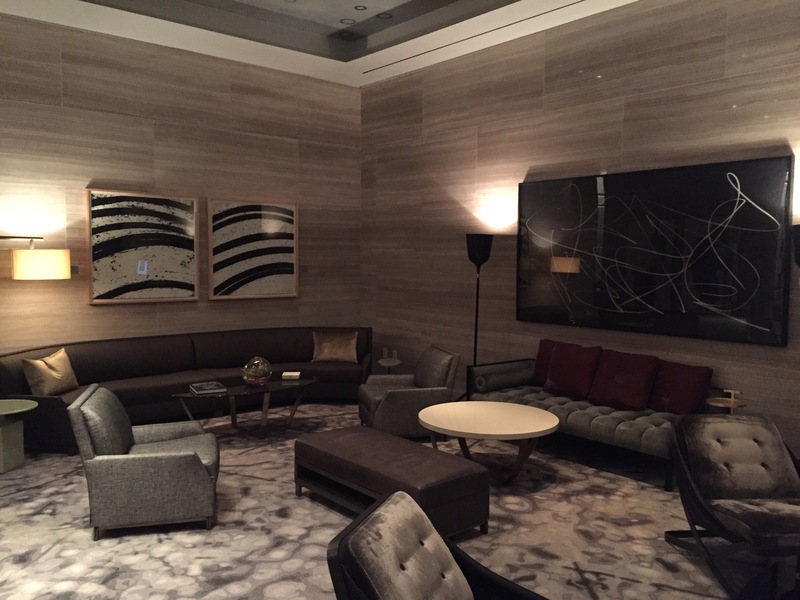 And what better place than at the Park Hyatt New York? 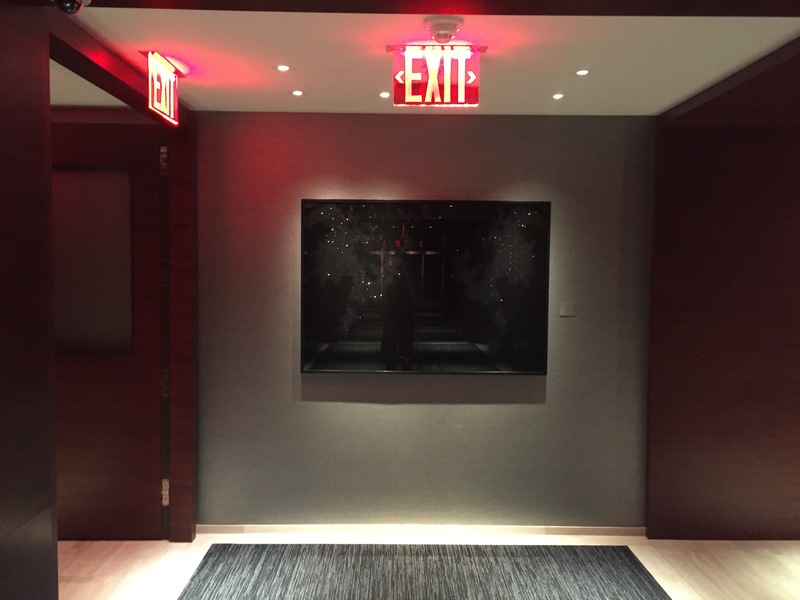 The Good: Top-notch facilities, with impeccable attention to detail. Olympic-length swimming pool and fitness center with grand views of Carnegie Hall or slightly obstructed views of Central Park. Excellent value for a free night certificate, as rates typically start at $650 – easily pushing into four figures during peak season. 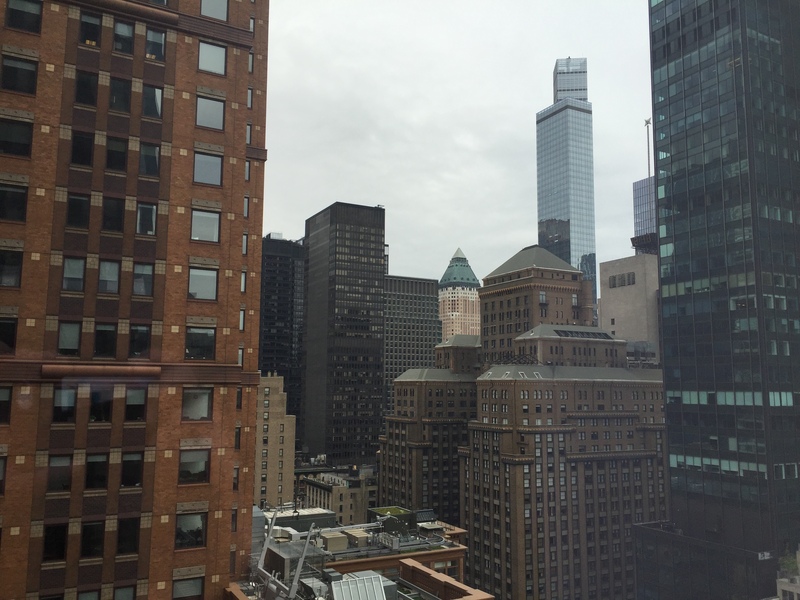 Upgraded to a “King Deluxe” room with modest city views as a Hyatt Platinum guest. 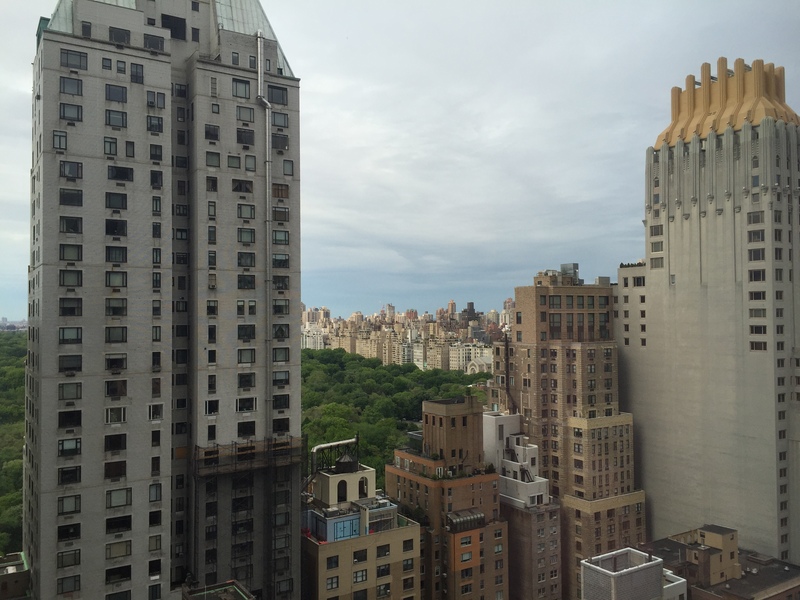 Easy access to Central Park, with a hotel car taking you anywhere within 10 blocks of the hotel, just far enough for a few other major tourist attractions. 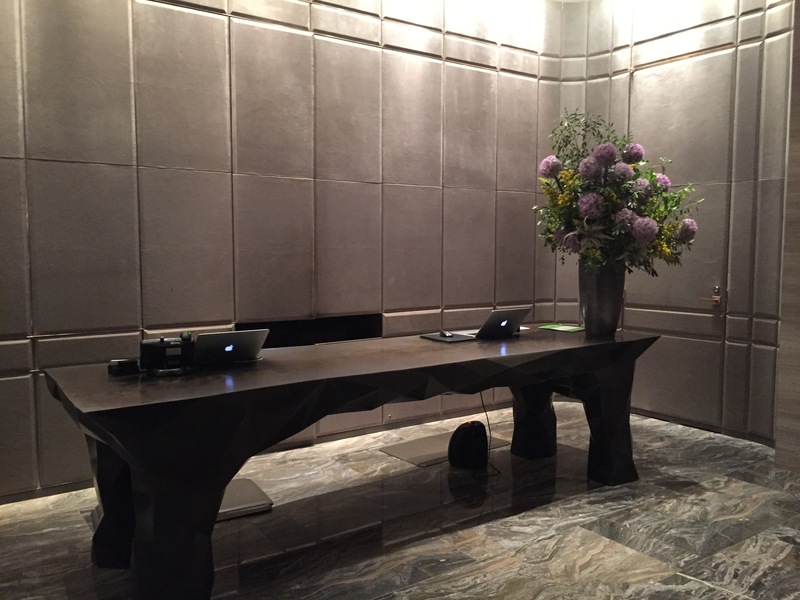 The Bad: Service seems a bit wanting for a five-star hotel, let alone for the global flagship of the Park Hyatt brand. Experienced minor cleanliness issues throughout the hotel. Doors don’t seem very well sound-proofed, and ambient lighting from electronics and outside may disturb those who prefer sleeping in pitch darkness. Surrounding Midtown area is usually dead after 6pm and on weekends, though location is fantastic if you’re planning to visit the Lincoln Center or Carnegie Hall. Miscellaneous: Earned points (5,000 no less) even though this was a free night. Ordered room service breakfast for ~$40, and that charge never seemed to post on my card either. Interesting. 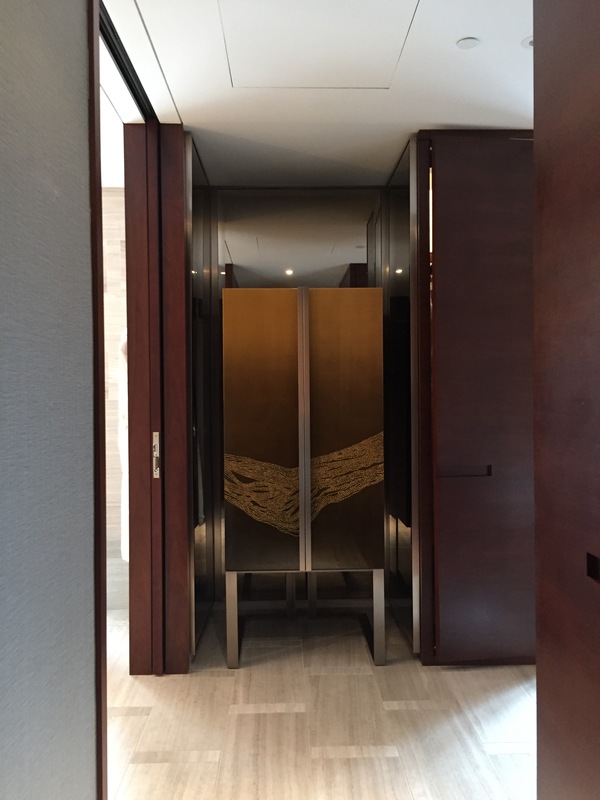 As one of the newest entrants to an already-crowded luxury hotel market in the heart of Manhattan, the Park Hyatt in New York has been meticulously crafted (and marketed) to be the international flagship property of the Park Hyatt brand. 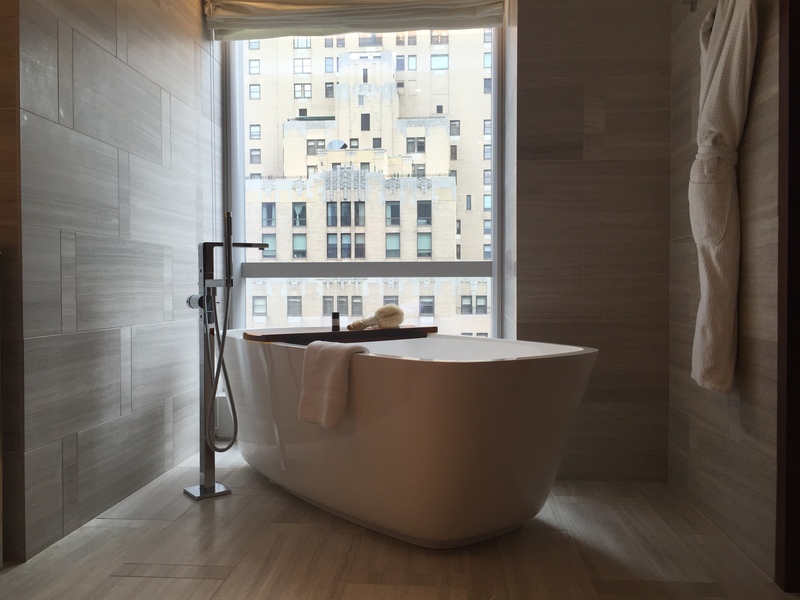 If luxury has to be expensive, there’s no doubt the Park Hyatt New York’s got that covered. During peak season, rates start at just under $1,000 for a standard room, building its way up to a few grand for the larger suites. I’ll admit that living in New York (and San Francisco before that) has de-sensitized me to exorbitant prices. I don’t so much as blink at $9 beers or $6 boxes of cereal anymore. Just don’t get me started on rent. 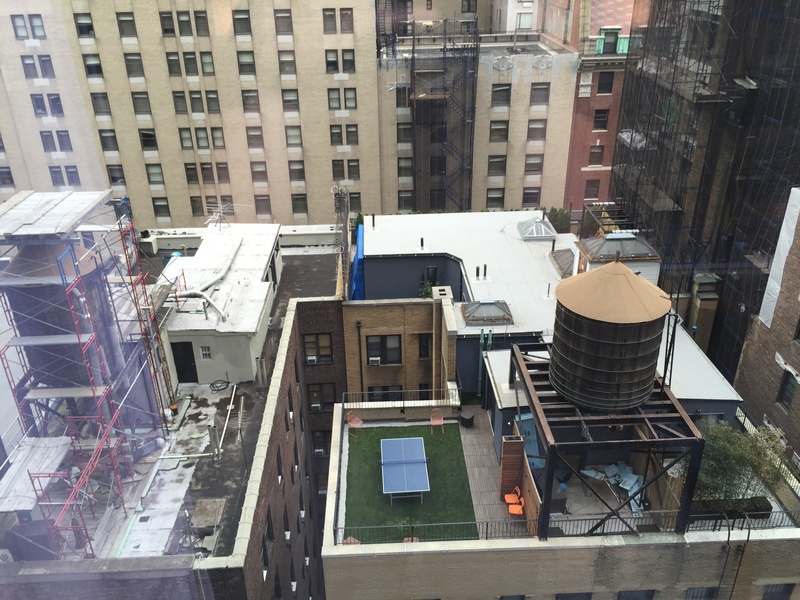 But the thought of dropping $1,000 per night for a standard hotel room, which is more common than you’d think for 5-star joints in New York, is mind-boggling. 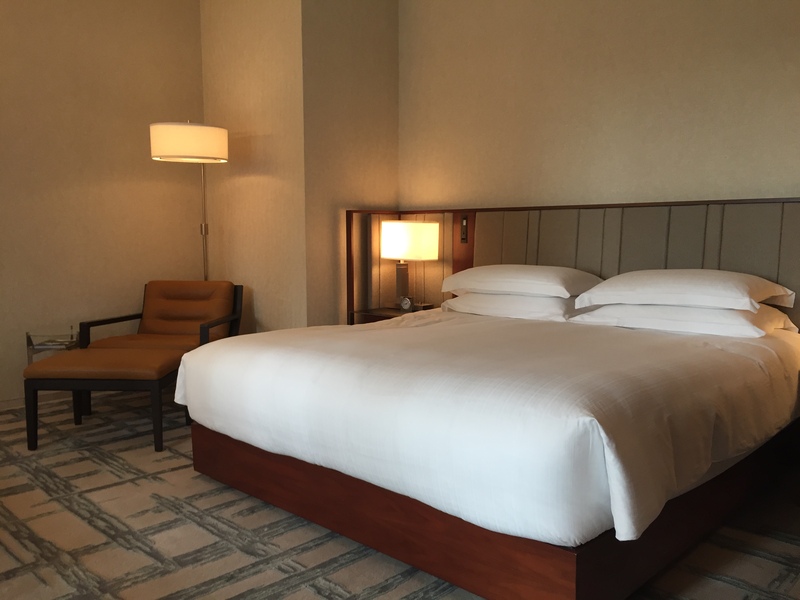 Lucky for me, I still had my two free night certificates from the Hyatt Chase Visa card. With no category restrictions, the certificates were a breeze to redeem over the phone the night before my stay. 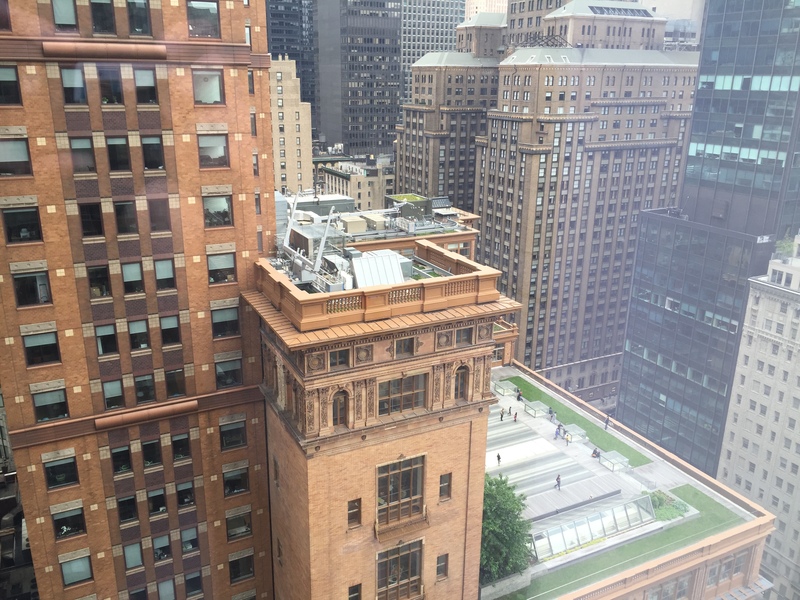 The Park Hyatt New York is located on 57th St, closest to 7th Avenue. 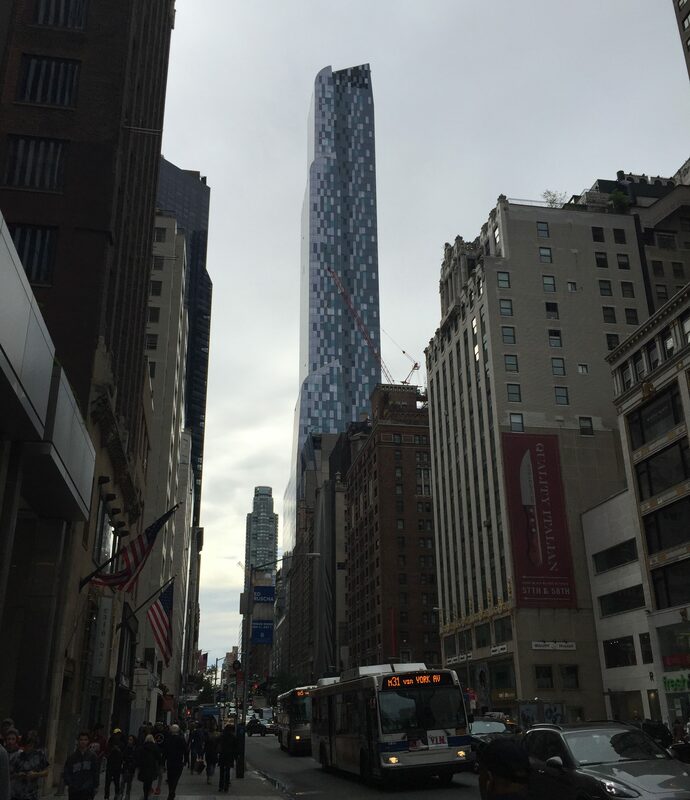 It’s right across the street from Carnegie Hall and two short blocks south of Central Park. The nearest subway stops are the N/Q/R on 7th, the F on 6th, or the A/B/C/D/1/2 at Columbus Circle. I don’t think a lot of guests at this particular establishment arrive by subway, but I did, and now you know. You’ve arrived when you come across an entry-way with blazing fluorescent lights bright enough to tan your skin to a tone the Donald would be proud of. I like to think I’m a self-sufficient traveler. I book my own hotels and flights. I try to find directions on my own (admittedly with varying levels of success). And I also like to carry my own bags. So it was actually refreshing to receive a simple hello at the doors without being stopped and asked if I needed help with my bags or a personal entourage to follow me to the check-in desk. I was already familiar with the ground floors of the hotel, so I made a beeline for the elevators with a single duffel in tow. I imagine the staff would have been more proactive had I arrived with boatloads of luggage and a more confused expression. 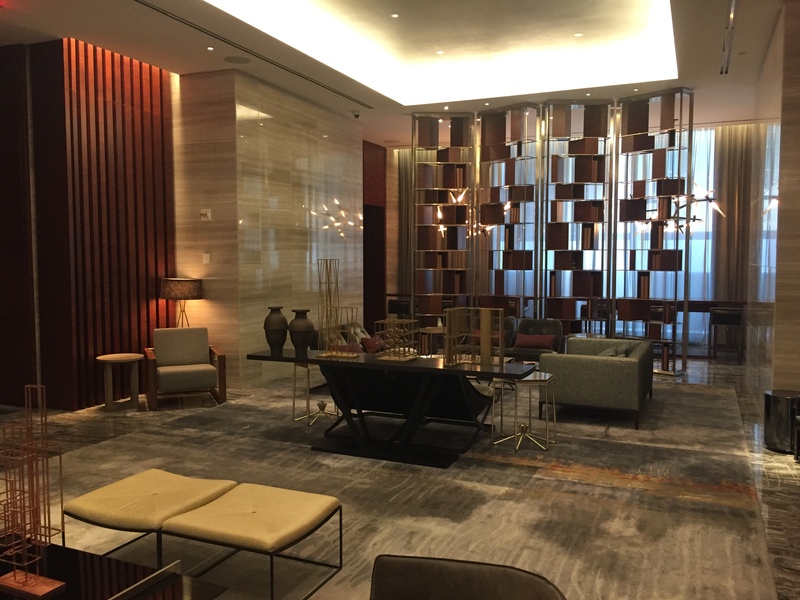 The check-in desk is located on the third floor, around the corner from the hotel’s bar and restaurant and right across a well-appointed lobby lounge. I arrived to a relatively quiet lobby at around one in the afternoon, and a lone employee manned one of two Macbooks at the check-in desk. She happened to be on the phone when I approached the desk, which got a little awkward as I inevitably overheard their conversation for a few minutes. 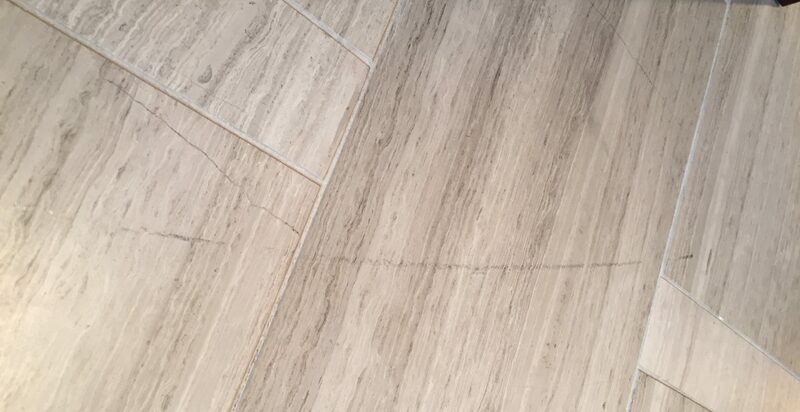 Apparently, a guest had accidentally left “a couple hundred dollar bills” in his room and could a manager please look into this … ? I can see how certain guests might be a little peeved at this initial interaction. 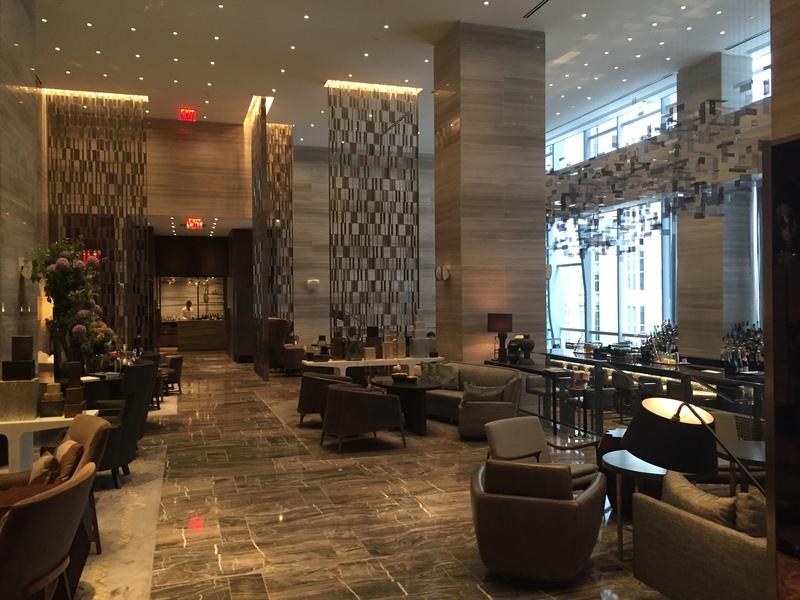 It’s unusual to be kept waiting for check-in at a hotel as ritzy (and expensive) as the Park Hyatt New York. It’s also unusual for the desk to be staffed by a single employee. But it didn’t really bother me, maybe because I’m not the type to have hundred dollar bills floating out of my pockets wherever. So I waited patiently until she got off the phone to check-in. If anonymous Internet reviews are to be believed, guests staying with points or free night certificates are treated like dirt at this hotel. That’s a spiteful exaggeration I’m sure, but I can see how a hotel might prioritize paid stays over reward stays, especially since reward stays are often reimbursed at a marginally lower rate than the lowest paid rate. 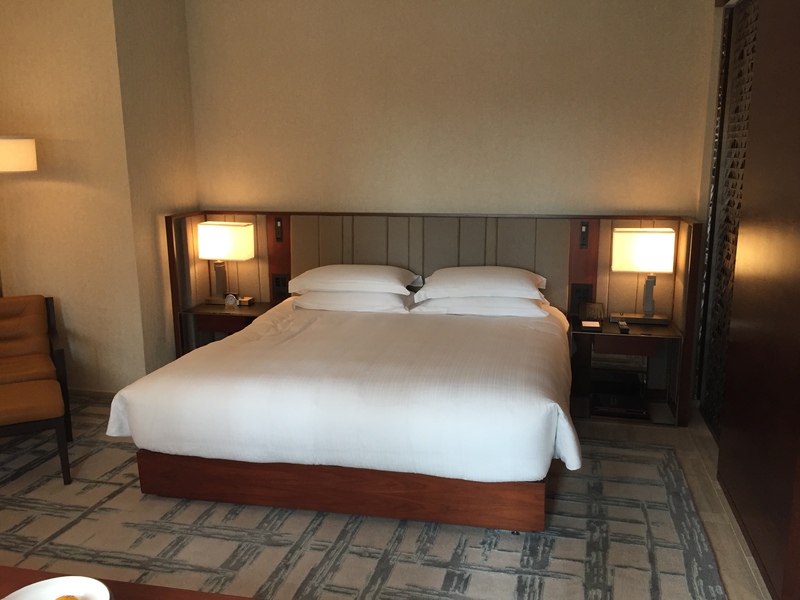 So I was pleasantly surprised to be told that yes, my room was ready at 1pm (even though the official check-in time isn’t until 3pm), and that, as a Platinum Hyatt member, I had received a complimentary upgrade from a Park King to a Deluxe King on a higher floor. I was also proactively offered late check-out until 2pm, though there seemed to be little flexibility beyond that as is typical with Hyatt properties. 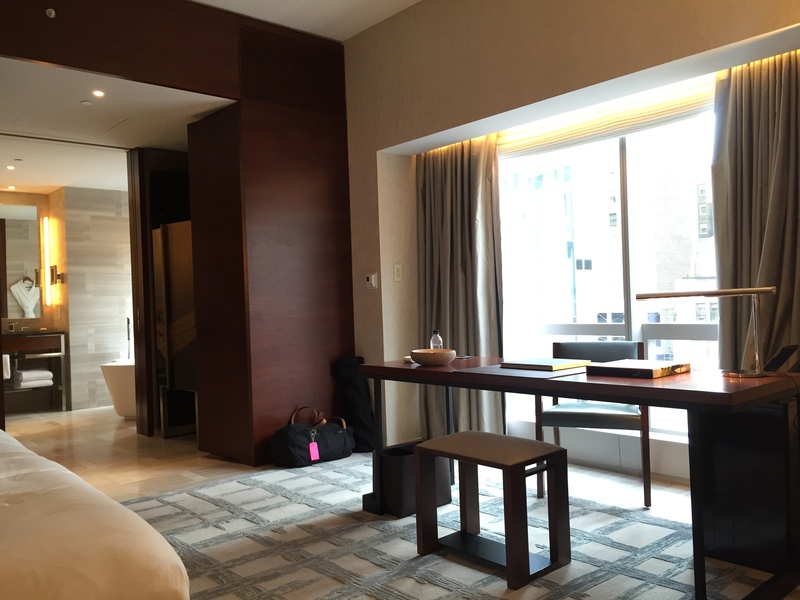 Not bad for a free night’s stay, especially considering the Platinum status comes free with the credit card too. I wasn’t offered any help with my bags or to be personally escorted to my room as is common in some five-star hotels, which was fine, since I honestly don’t understand why this “show me to my room” service is even a thing. These blurry crooked photos notwithstanding (I had a heavy duffel bag over my shoulder remember? ), the one thing of note in the hotel’s hallways is that it smelled really nice. I’m not a big fan of the overly-perfumed “signature scents” that’s trending at hotels and even airport lounges nowadays. Personally, I don’t like arriving to what smells like a Bath and Body Works after a long red-eye flight. But this hotel had a distinct scent of quality leather. It’s really subtle, and I wouldn’t be surprised if it came naturally from the furnishings, though more probably the toiletries on the passing housekeeping carts. 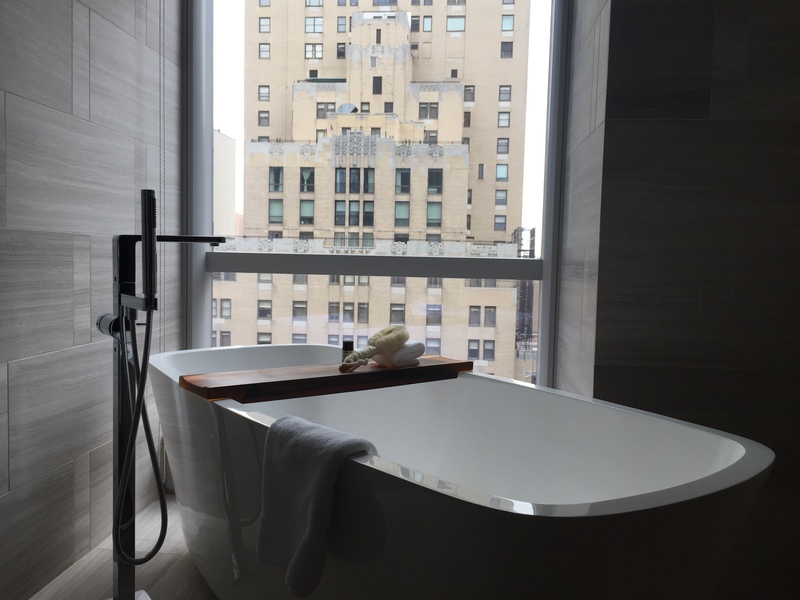 The Park Hyatt New York has 118 standard guestrooms and 92 suites, occupying floors 8 to 25 of the One57 building, with the rest being multi-multi-million dollar condos on up. Standard Park Kings are located on the lower floors up to 16, with the higher floors reserved mostly for suites and Deluxe King Rooms. Deluxe rooms are pretty much identical to Standard rooms, with a bit more square footage, closet-space, and better views. 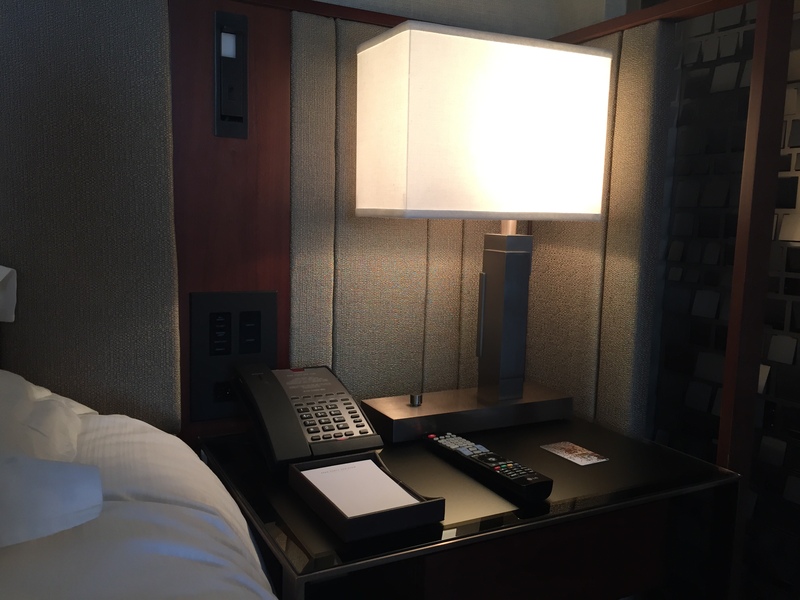 I was in a happy middle, quite literally, with the complimentary upgrade placing me in a Deluxe King Room on the 16th floor. 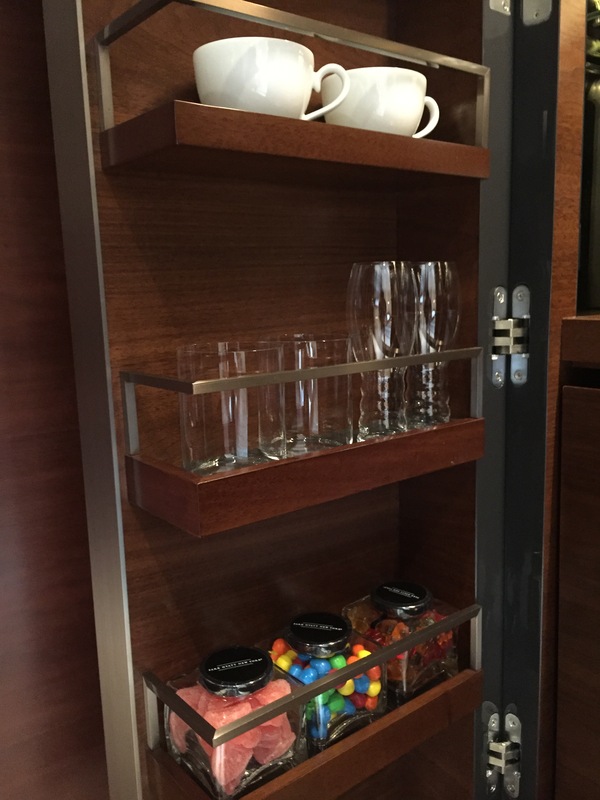 Upon entering my room, I found myself staring straight at the minibar, with a closet neatly separating the living area to my right, and sliding doors leading to the bathroom to my left. 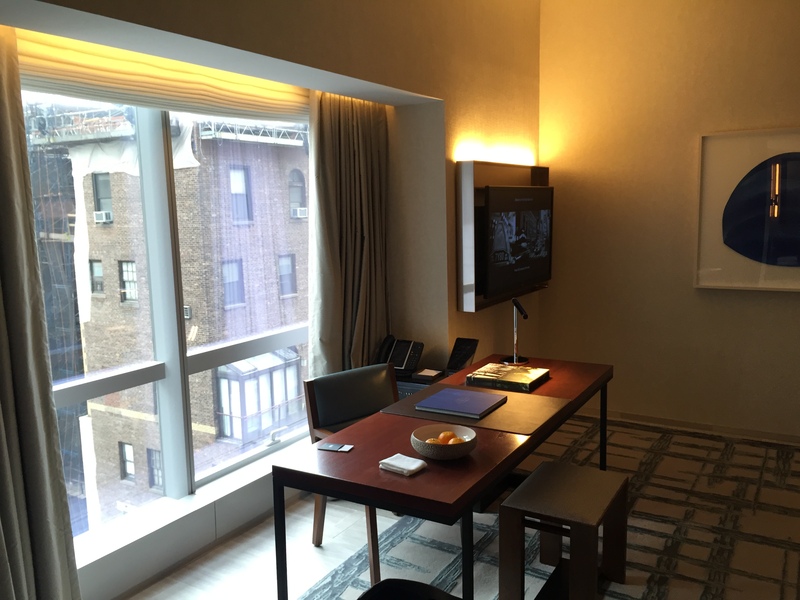 As you may have heard, the rooms at the Park Hyatt New York are big. Really big, by New York standards. I was also impressed by how thoughtfully the room was partitioned. Besides the closet and metal divider that separated the bed from the entryway (creating a hallway of sorts), the desk was set facing the bed instead of crammed into a corner. Unlike some guests, who were slightly disappointed by less-than-stellar views “of a fantastic concrete wall,” I was happy to see that being on the 16th floor was just high enough to be taller than the immediately adjacent building, which afforded relatively pleasant views of the cityscape around me. 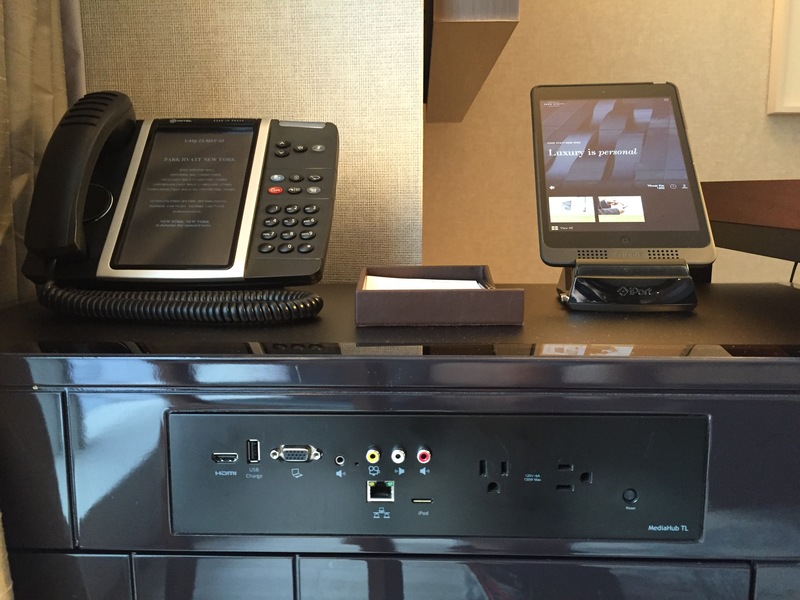 The desk itself was set-up as a workstation, with easy access to your standard array of VGA, HDMI, Aux ports, and power outlets – as well as a hotel iPad where you could order room service, extra toiletries, or even read your preferred newspaper. 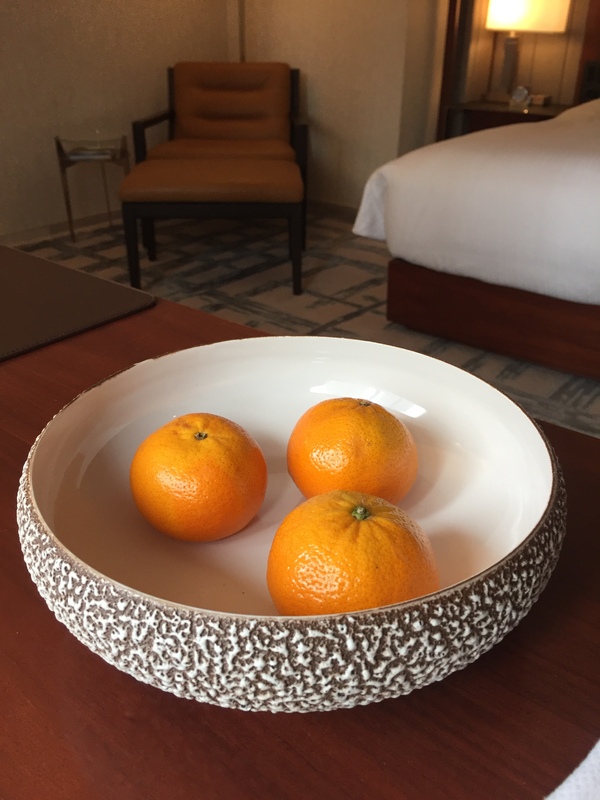 There was also a bowl of tangerines that I guess served a “welcome amenity” for the duration of the stay. Sadly no free champagne or chocolates this time around, though these are more common for special occasions like anniversaries or honeymoons if you let them know. 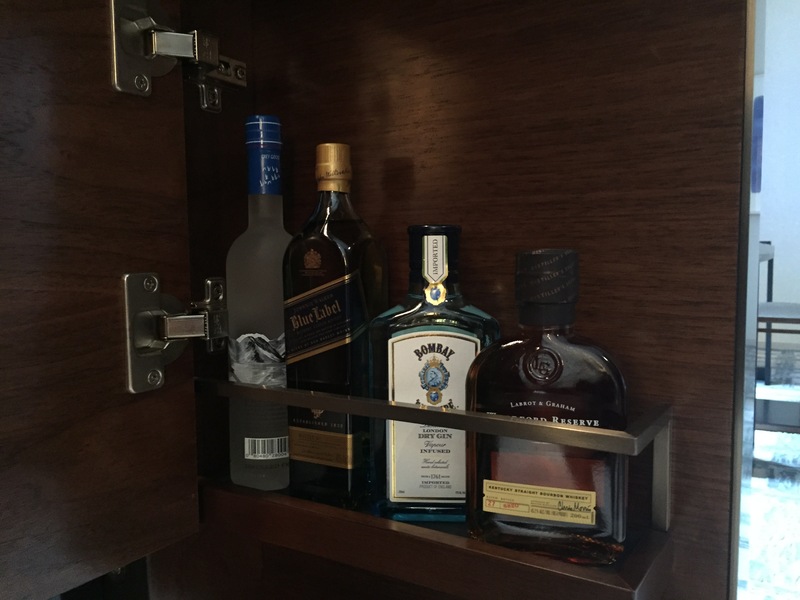 The swanky minibar I mentioned earlier was well-stocked with all the things you’d expect to be stocked at the Park Hyatt .. everything from a $180 half-bottle of Krug and $18 M&Ms. Thankfully, the Nespresso, T Salon tea, and hotel-branded water were free. 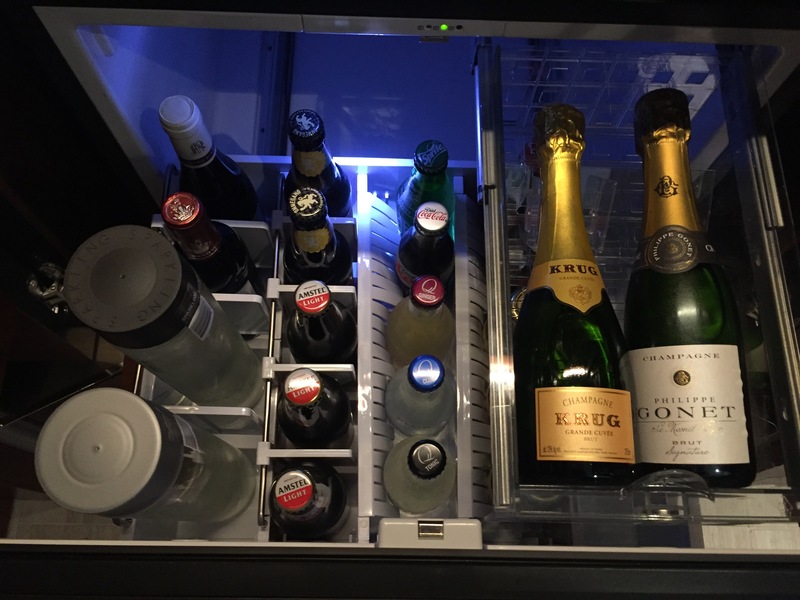 But for what it’s worth, the liquor was surprisingly, if relatively, affordable. The Bombay Sapphire ($40), Grey Goose ($45), and Woodford (also $45) all came in ~200mL sizes, which pours about 4 drinks. Math tells us each standard “drink” would then cost about $11-13 after taxes, which is about what you’d expect at any bar in Manhattan – maybe even cheaper! Can’t comment on that Johnny [sic] Walker Blue though. As I was getting settled in, I continued to be surprised by little furnishing features that suggest someone, somewhere, put some thought into designing the rooms. When I first walked in, I noticed that the TV was placed in an odd-spot, all the way in the corner, making it difficult to view from the bed. 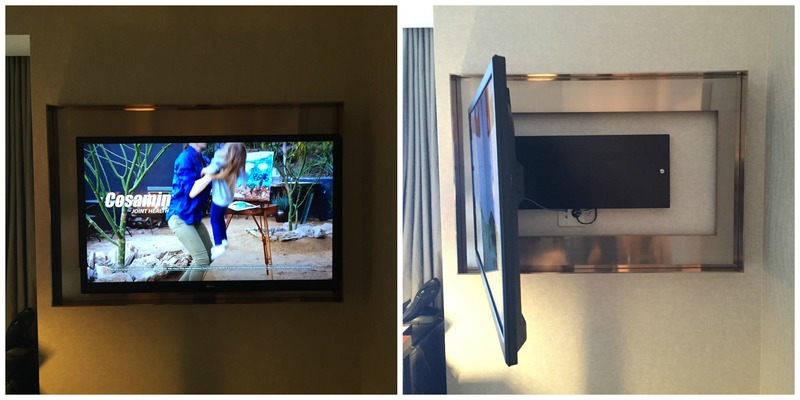 Well, wouldn’t you know that the TV swivels out a full ninety degrees! 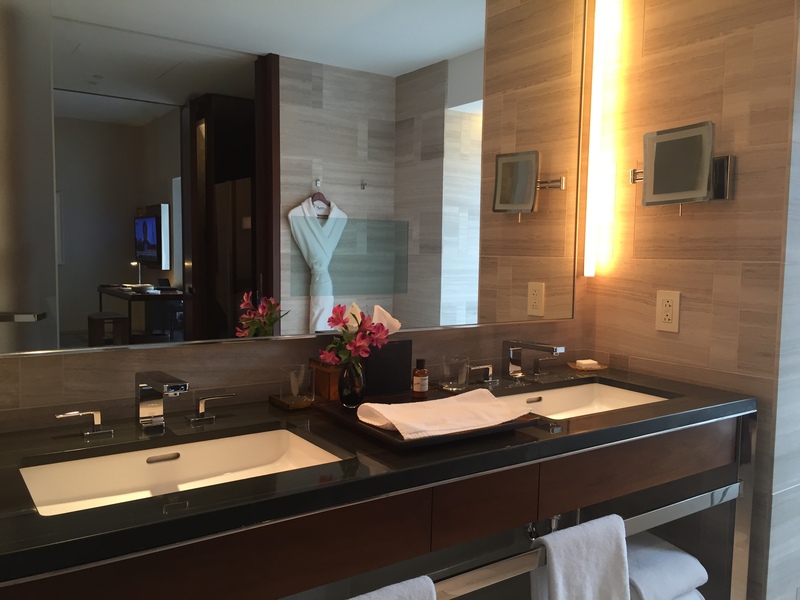 I don’t usually dedicate an entire section of a review to a hotel bathroom, but the Park Hyatt New York might be the exception. It’s not every day that a bathroom takes you on a roller coaster of emotions. Why yes, yes it was. The Park Hyatt New York’s impeccable attention to detail was evident here, too, with heated floors and automatically de-fogging mirrors in the double-head shower. 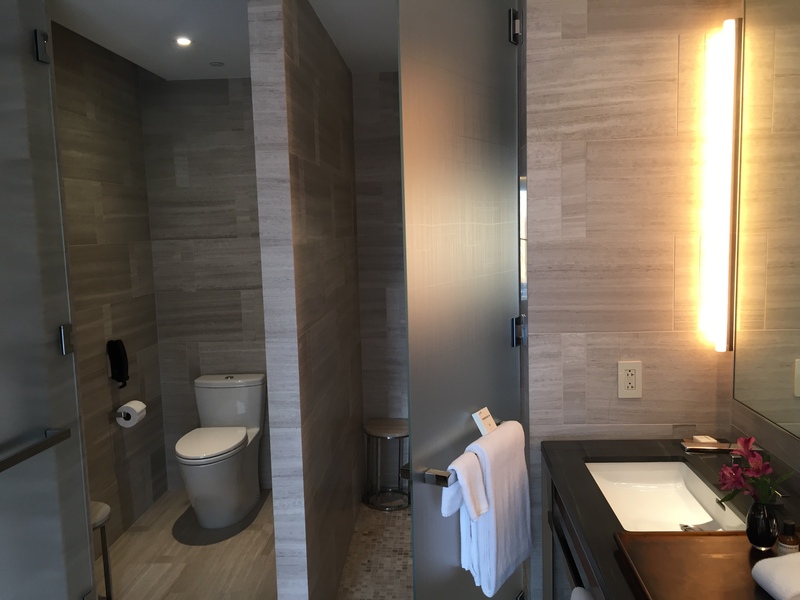 The hotel touts that every room in the building has a “five piece bathroom,” which I imagine consists of the toilet, shower, double sink, and free-standing tub. 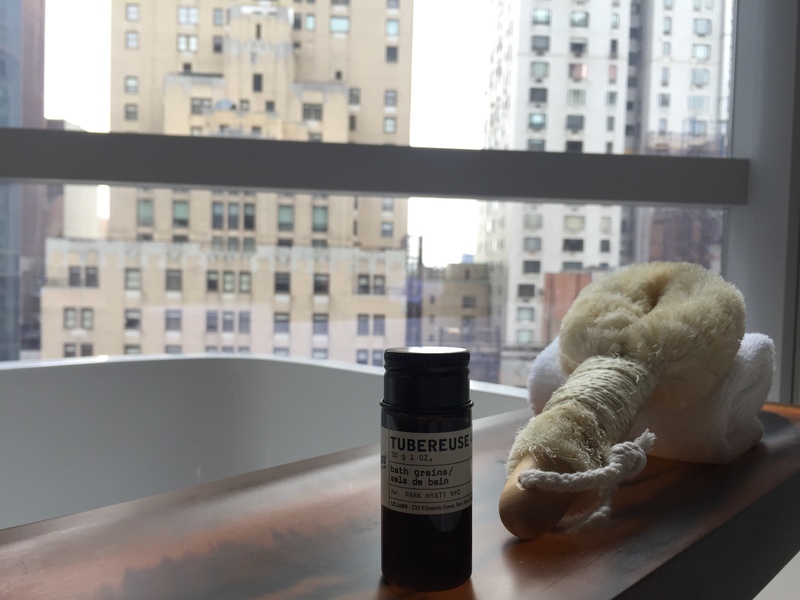 Le Labo New York provides the toiletries, in generous 2oz bottles (instead of your standard 1-1.2oz) of Tubereuse 40, which as it turns out, does seem to be the source of the mysterious scent in the hallways. 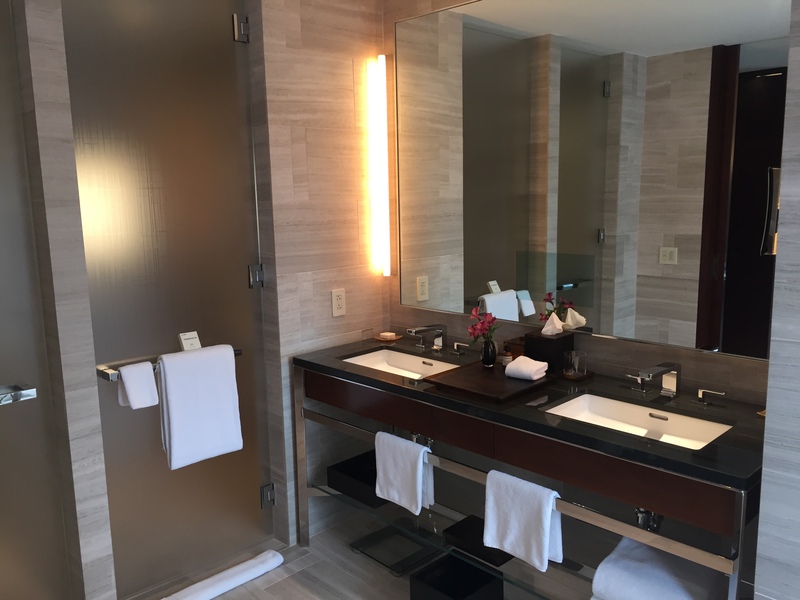 There’s a TV in the mirror, plush bathrobes hanging from the walls, and a neat motion sensor that turns on a dim “night light” under the double-sinks. It helps prevent stumbling around in early morning darkness, but I did find the motion-sensors to be a bit finnicky at times – but more on that later in the cons section. First, it was time to explore the rest of the hotel! 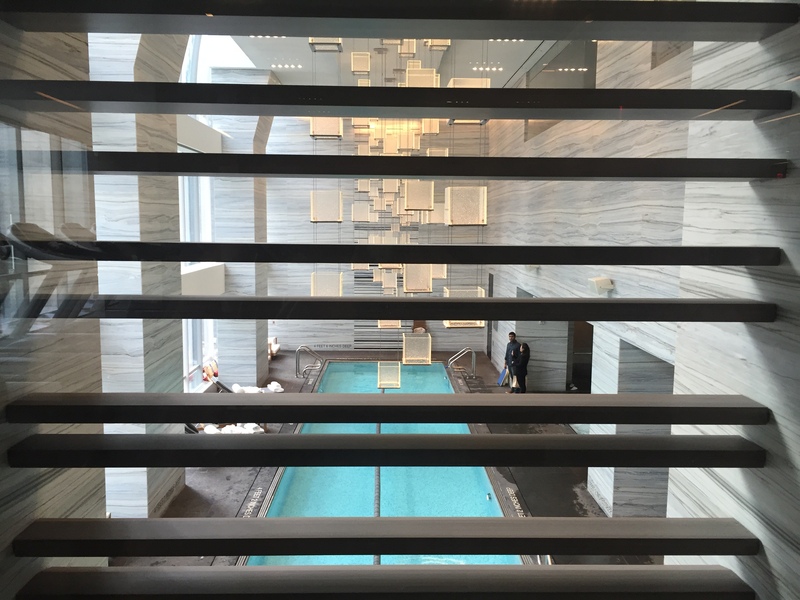 Few hotels in Manhattan have an indoor swimming pool, and even fewer have one as nice as the Park Hyatt New York. 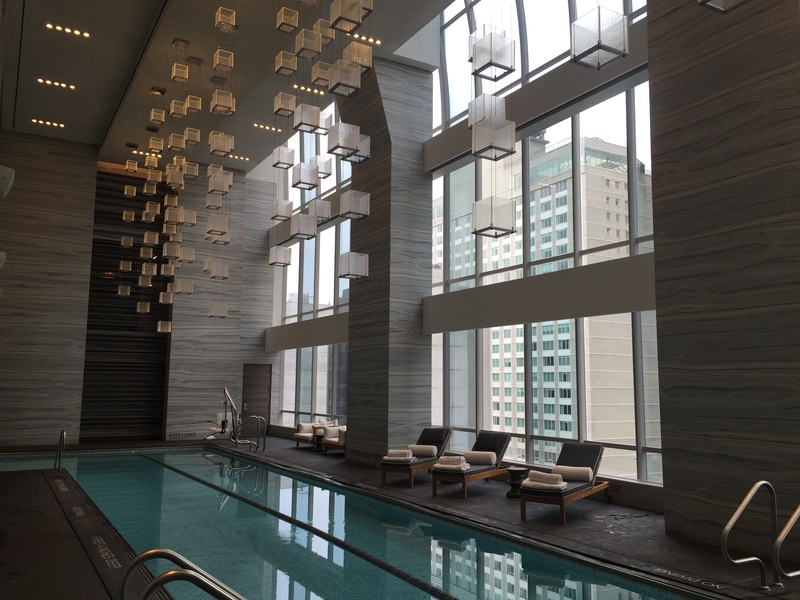 Located on the 25th floor, the pool is a defining feature of this property, and for good reason. Open until 9pm every evening, the pool features deck chairs, under-water speakers, and expansive views of neighboring skyscrapers and Carnegie Hall. There’s also an on-duty lifeguard, just in case. 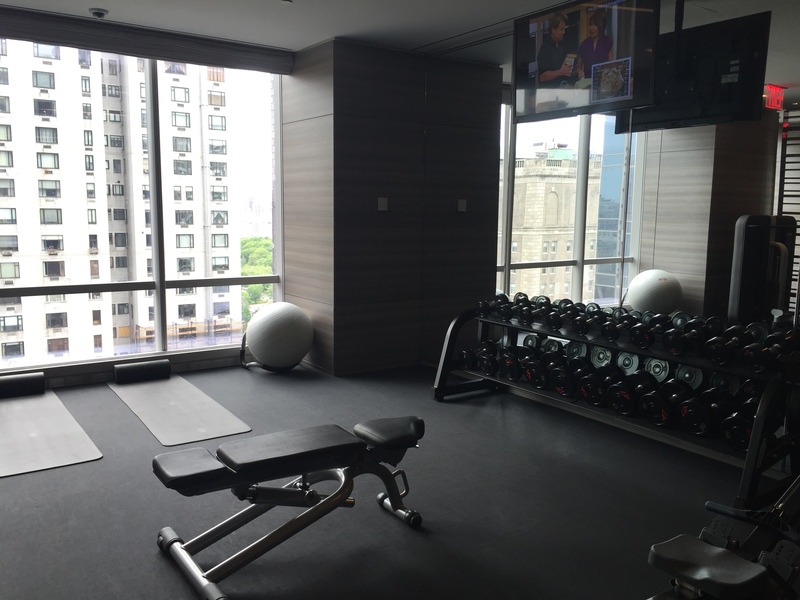 The hotel’s gym, located a floor above the pool, is open 24 hours a day. The views are spectacular. 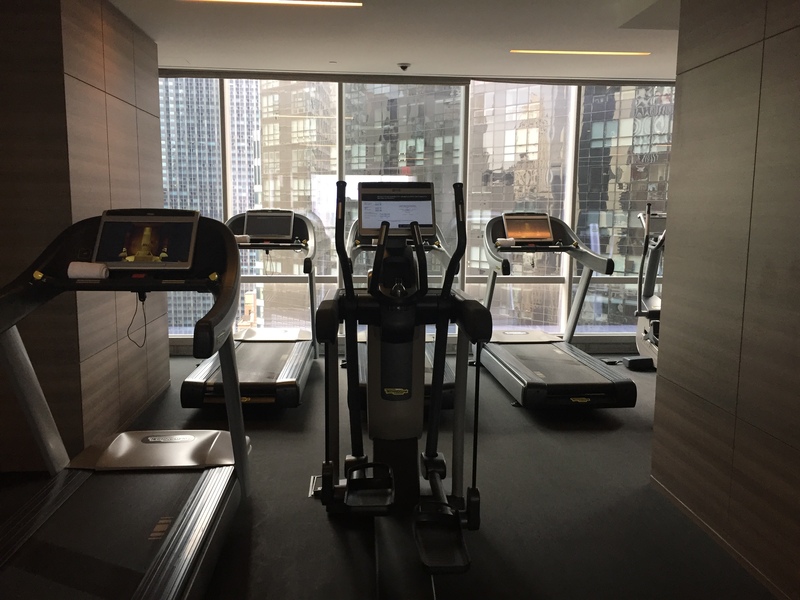 There’s plenty of treadmills, ellipticals, and stationary machines, most of which are equipped with a cable-style mechanism that allow for a slightly greater range of motion than traditional strength machines. 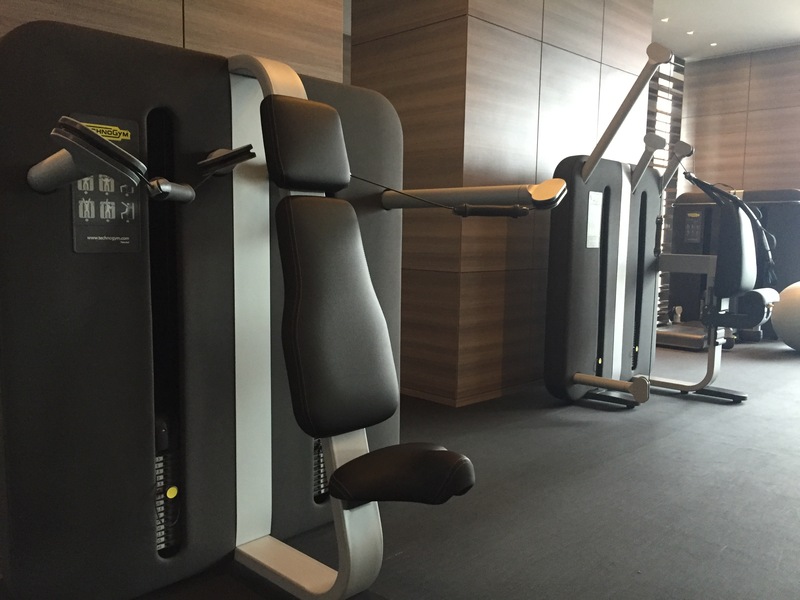 Like most hotel gyms, the heaviest free-weights are 50 pounds, and unfortunately there weren’t any heavier dumbbells available in storage anywhere. But with plenty of medicine balls, yoga blocks, and other miscellaneous fitness equipment, there’s enough to keep you occupied. 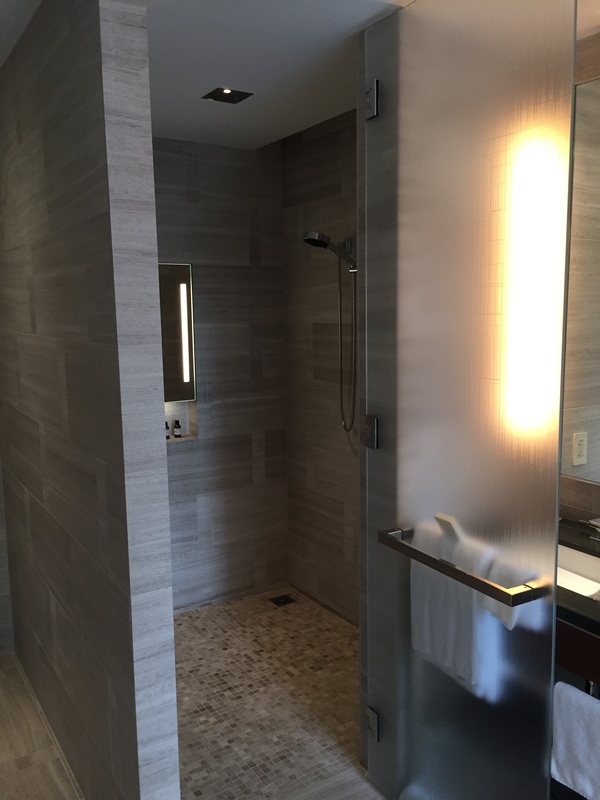 The hotel also includes a full-size locker room, complete with spacious showers, hot tub, and steam room, presumably for spa day visitors or guests who’d rather change on the 25th floor. Nalai Spa is opposite the gym, right next to the pool, and welcomes both outside visitors and hotel guests who’re willing to throw down a few hundred dollars for all their beauty and relaxation needs. I believe a spa treatment gives you day access to both the pool and gym (double check that), so that might be something to look into if you’re ever in the area and want to treat yo’self. 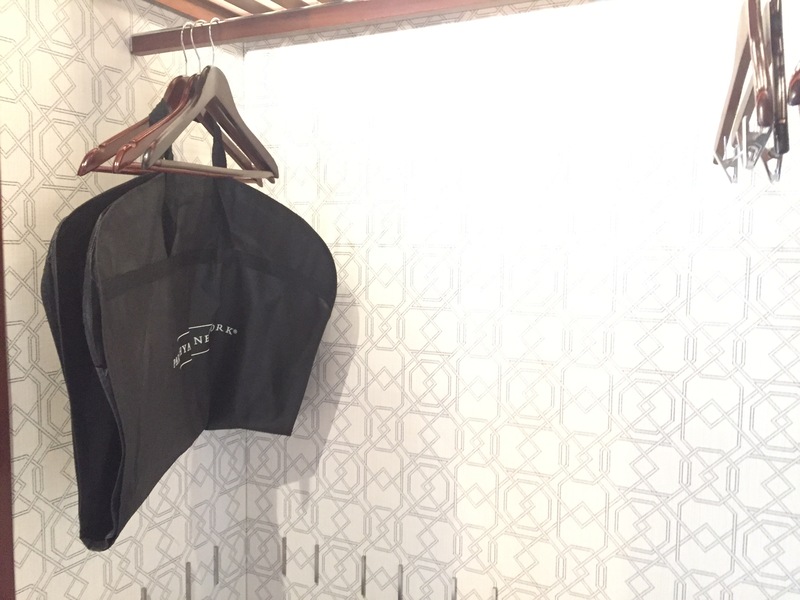 In terms of other amenities, the Park Hyatt New York offers a complimentary shoe shine and two free garment pressings per stay in case your clothes got a little wrinkly in your luggage. You can also take a bike for a spin (up to 2 hours) during warmer months, which could be perfect for a mid-day loop around nearby Central Park. The hotel’s complimentary car service is a much-hyped amenity, though I question how useful it actually is. It’ll only take you 10 streets up or down, which isn’t far enough to get you to Grand Central and certainly no where close to Penn Station. It is, however, just far enough to take you to the Lincoln Center on 66th, the MoMa on 52nd, and the Rockefeller Center on 47th. Last but not least, the first few floors of this hotel is reserved for event and meeting space. 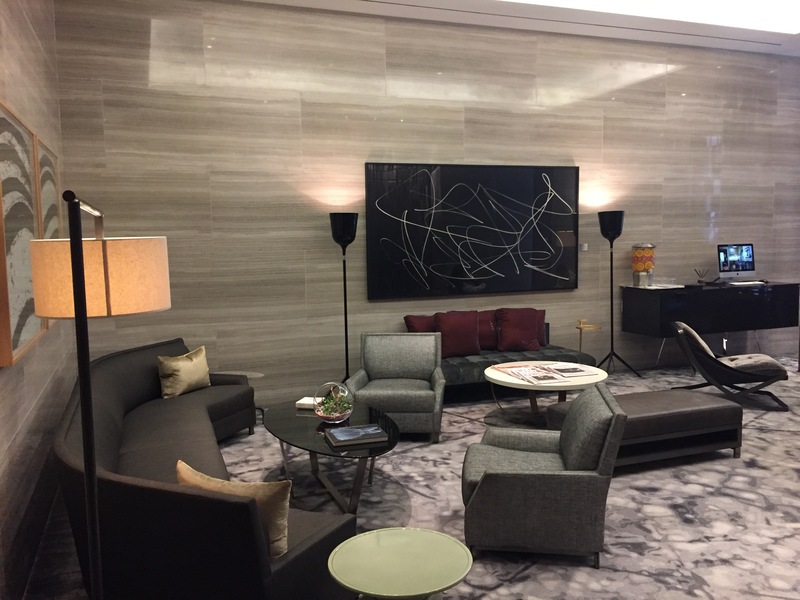 The event space occupies the floor between the entrance and the third-floor check-in lobby, and offers a quiet resting or meeting space when events aren’t in session. 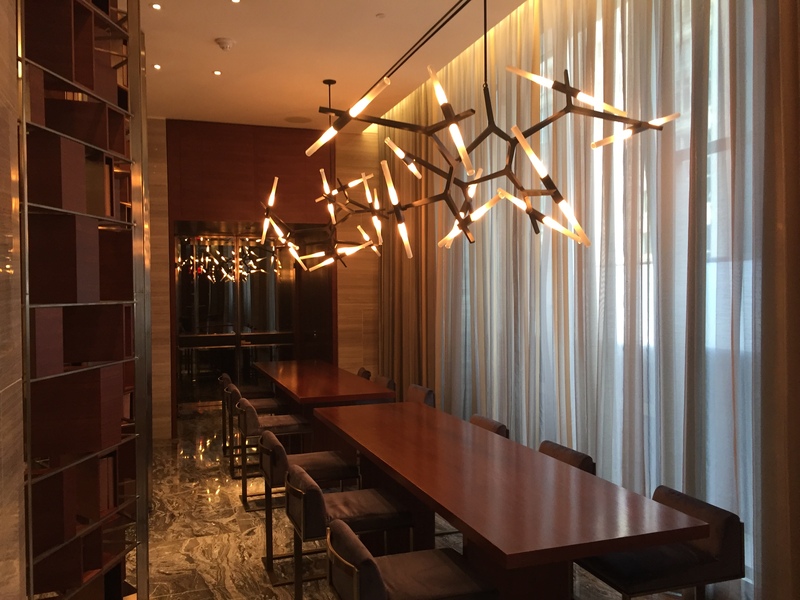 The Park Hyatt New York has two eating areas: the Back Room restaurant, and the Living Room, which offers lighter fare in a more casual bar and lounge setting. I didn’t have a chance to visit either during my stay, but I’ve stopped by the bar for drinks a few times in the past. Cocktails start at $18, which is about $4-7 cheaper than at the Four Seasons or Mandarin Oriental, and the service was always reliably perfect. You might also appreciate the finer details like the the metal stirring straws and cloth beverage napkins. In all, it’s a great place to grab a drink for those who prefer a more modern, relaxed environment over the stuffy country club-esque vibe that oozes from places like the St. Regis or Carlyle. I was short on time the next morning, so I did try out room service for breakfast. The prices were what they were, though I appreciated that everything cost the same for room service as it would’ve been in the Back Room. 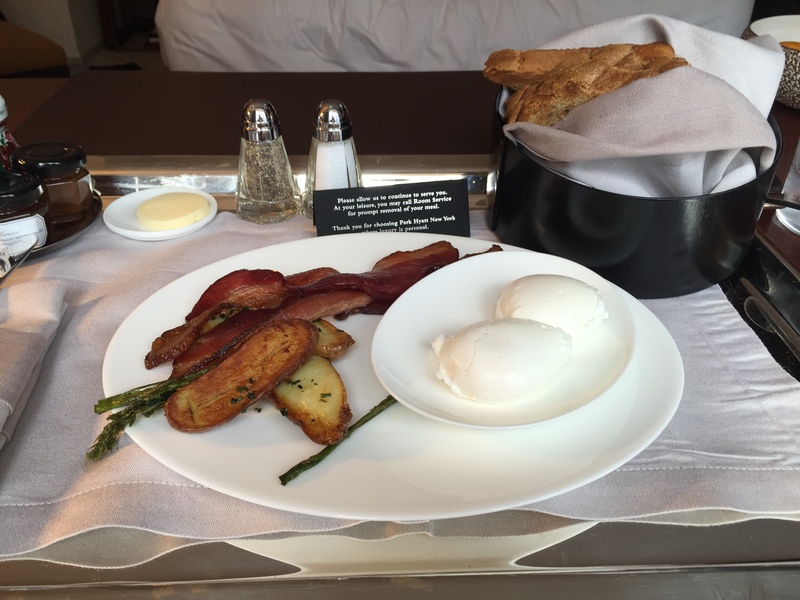 All too often, hotels will sneakily charge you 20-30% more for the same item on the room service menu versus the restaurant, in addition to the service charge (in this case $6) as well as the mandatory gratuity (20%). 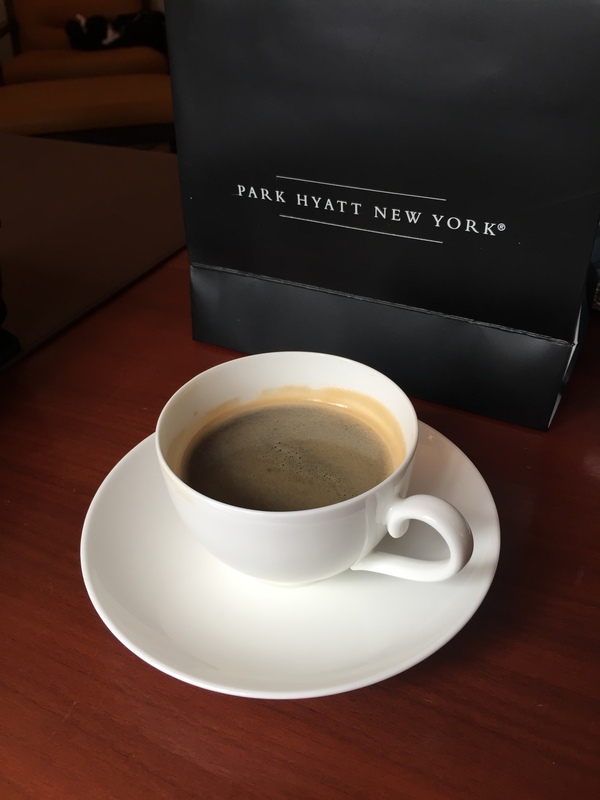 Hyatt Diamond guests get a $38 credit to be used for breakfast, just is almost enough to cover the ambitiously priced “57th Street Breakfast” which’ll afford you a cup of coffee, juice, eggs, toast, and your choice of protein. 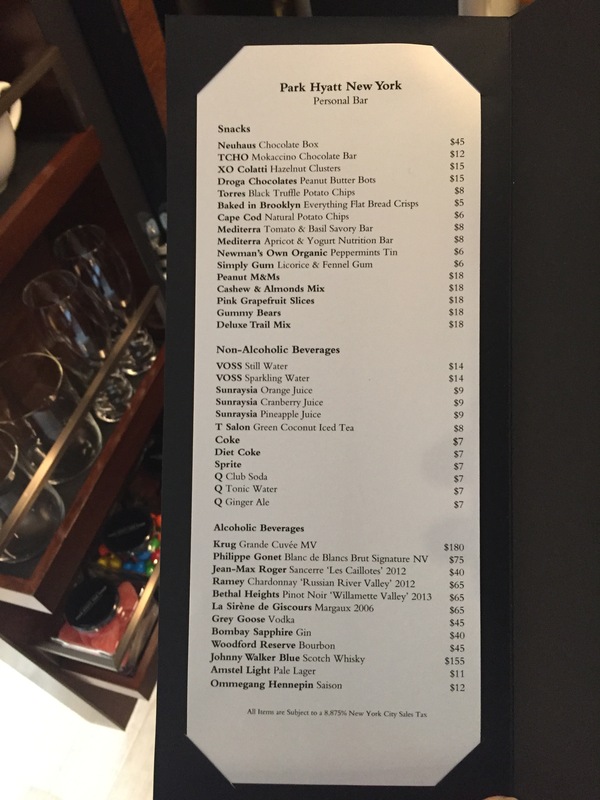 If you’re so inclined, you can opt for the almost-offensively opulent monstrosity that is the “Backroom Breakfast for Two” – Dom Perignon, caviar, steak and eggs, and foie gras for a cool $400. And yes, that is per person, which leads one to wonder – is it really $800+? I sure as hell wasn’t going to find out. Interestingly, I noticed that I could order the “eggs and protein” dish (available on the room service menu) for $21 and a side of toast for $4. 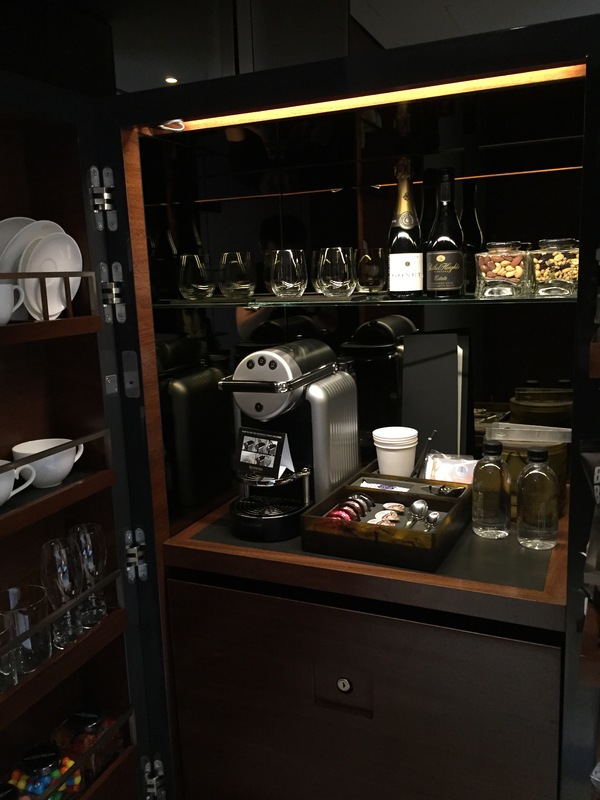 With free coffee from the in-room Nespresso machine, that was basically the 57th Street breakfast without the juice, so it seemed like the fiscally responsible thing to do in a thoroughly fiscally irresponsible situation. I ordered through the hotel iPad the night before, with delivery set to 8:30am, and everything arrived right on schedule at 8:32. Topaz Noodle Bar: Great Thai food, just one street down from the hotel. Petrossian Bakery: Paris-inspired bakery serving up pastries, cookies, and more, just around the corner on 7th. Carnegie Deli: A decent, if touristy, classic New York-style deli down a few blocks on 7th. 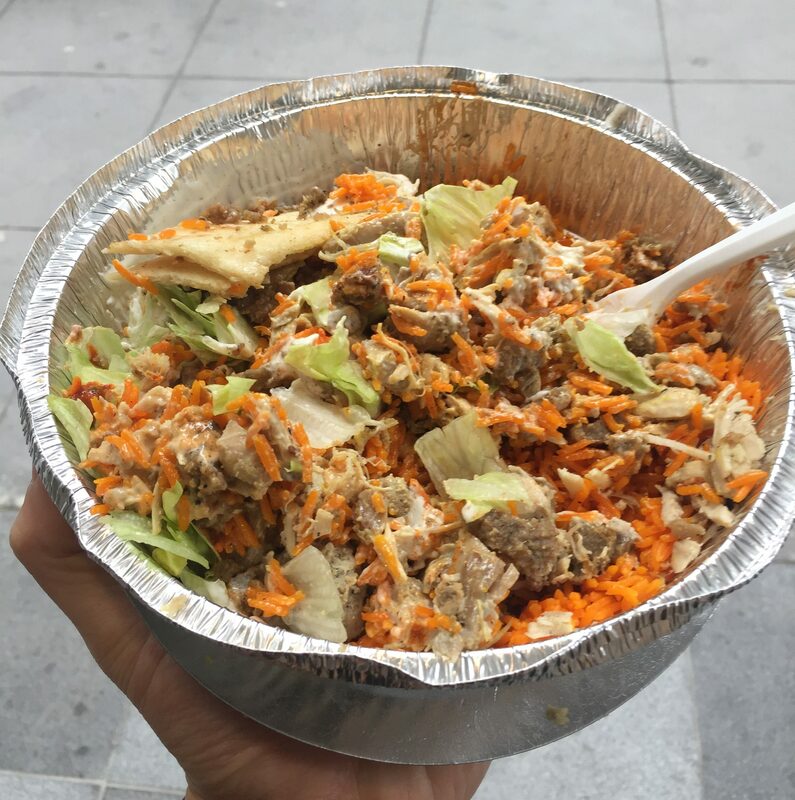 And of course, I’d be remiss if I failed to mention the Halal Guys, whose original cart is on 53rd and 6th. They’ve since expanded to brick and mortar location throughout Manhattan, but more importantly they now have three carts all on 53rd St. Two opposite each other on 6th (though be warned that the cart on the same block nearest 52nd is an imposter), and one on 53rd and 7th, right across from the Sheraton, which never seems to have a line. At $7 for a platter, it’s a budget-friendly alternative to lunch at the hotel, and hey – if you’re feeling YOLO, it’s close enough to take the house Mercedes down 4 streets. As a brief aside, the hotel has three TV channels dedicated to marketing the hotel. One is a 30-second loop of grandiose helicopter views of the hotel set to overly-dramatic music not unlike what plays before someone gets killed on the Game of Thrones. 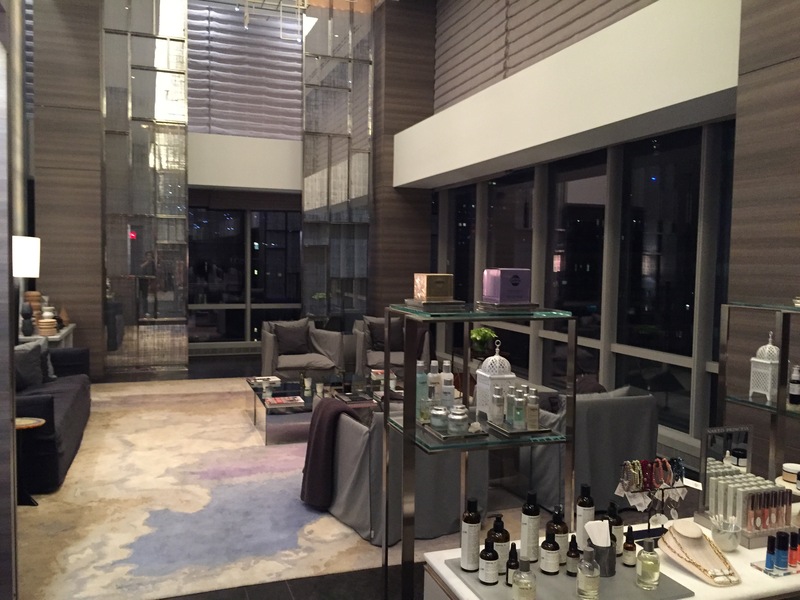 To be fair, many regular guests of the Park Hyatt New York probably like to go to the theater, have fancy dinners before heading to the Lincoln Center, and shop up a storm at nearby Columbus Circle. If this sounds like you, you’ll have a blast staying at this hotel. But as far as I know, Midtown is essentially deserted after 6pm, and it hardly gives you an idea of what the “real” New York is like – at least for me anyways. For an alternative “New York” experience, one that is, dare I say – hip – and cool, you might be better off staying at a boutique hotel in Soho, the West Village, or the Lower East Side. Note that I am completely abstaining from any debate over the “real” New York. As a fairly recent transplant, I know better. 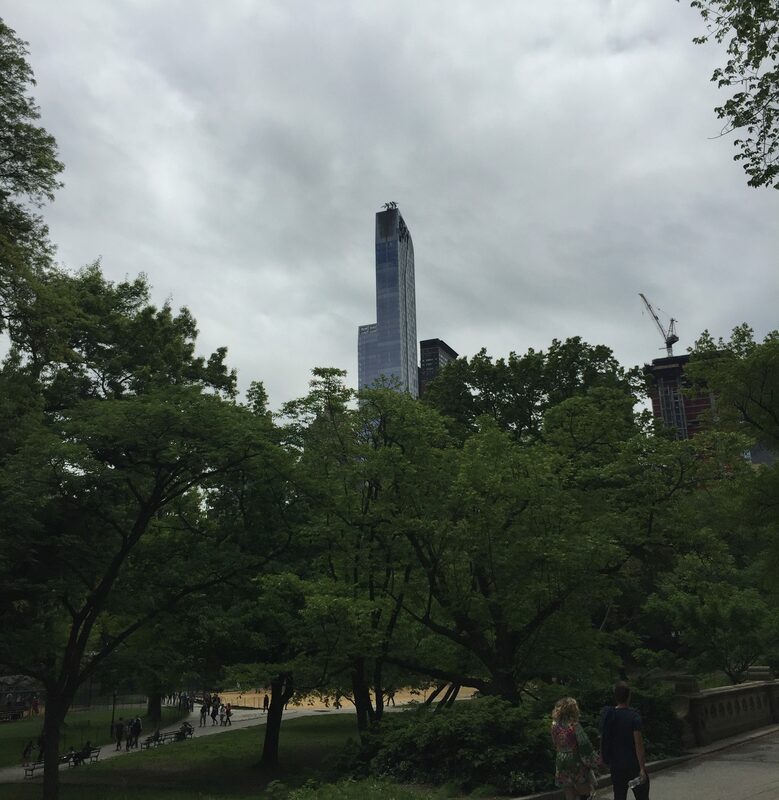 I will say that the one universally appealing site in the surrounding area is Central Park. I never realized how nice it was to live (or in this case, stay) so close to the park. 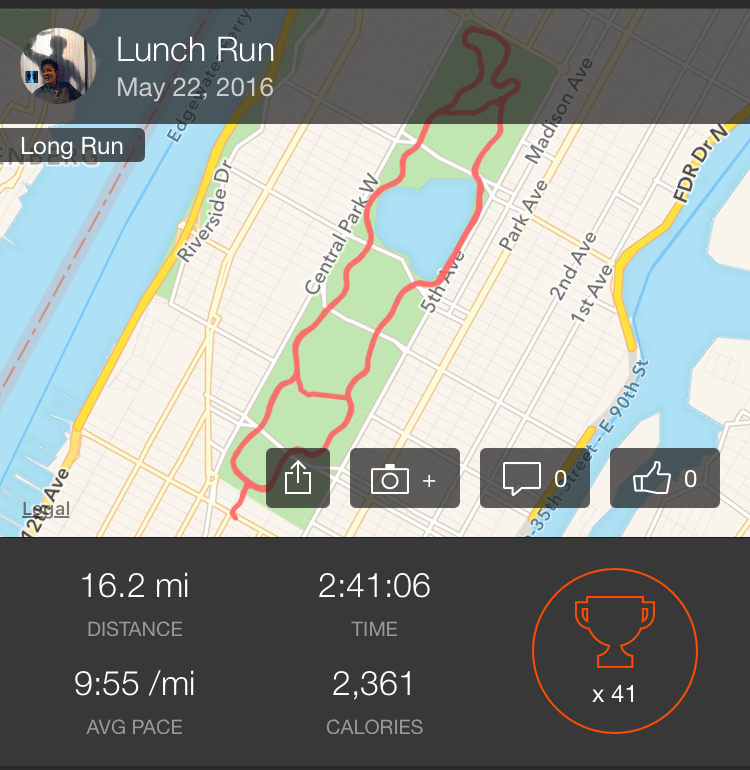 In fact, it was one of the main reasons I chose to stay this weekend, since I needed to run my final long run before my upcoming marathon. Unfortunately, it turned out to be a sad hobble four miles short of what my training plan prescribed, but I was off of that plan by weeks anyways. I’ll admit my expectations walking in were generally low. I was almost preparing to deal with a lot of snoot for redeeming my free night after reading a few negative reviews on my way over. Thankfully, my stay was completely snoot-free. Not only that, it was – as a whole – pretty fantastic. That being said, if I had actually paid a thousand dollars for the night, there were a few things that might’ve stuck out in a less than positive light. Let me preface all this by saying that when staying at a hotel, I try really, really hard not to think about cleanliness. I don’t go looking for dirt, so to speak. 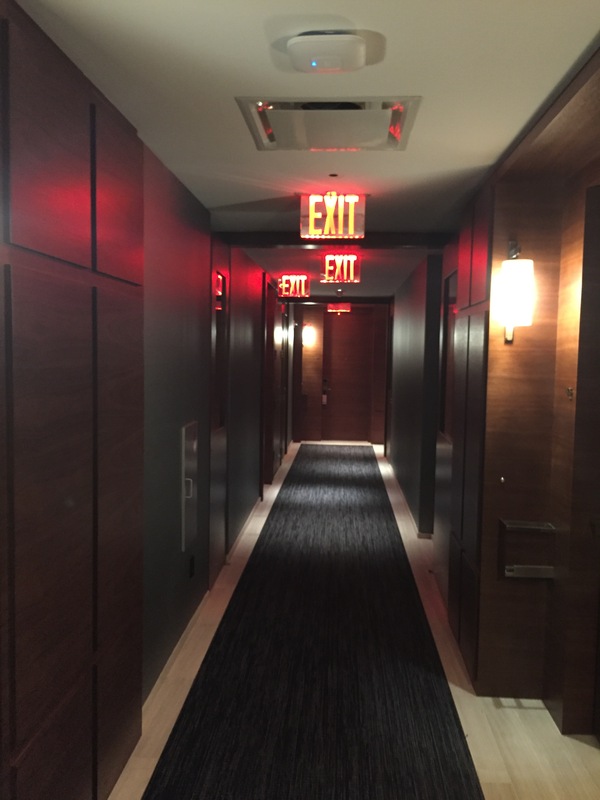 If you do think about it, and about all the people who stayed before you, and how understaffed the housekeeping staff usually are, and typical hotel room activities … Well, that’s why I try not to dwell on it. 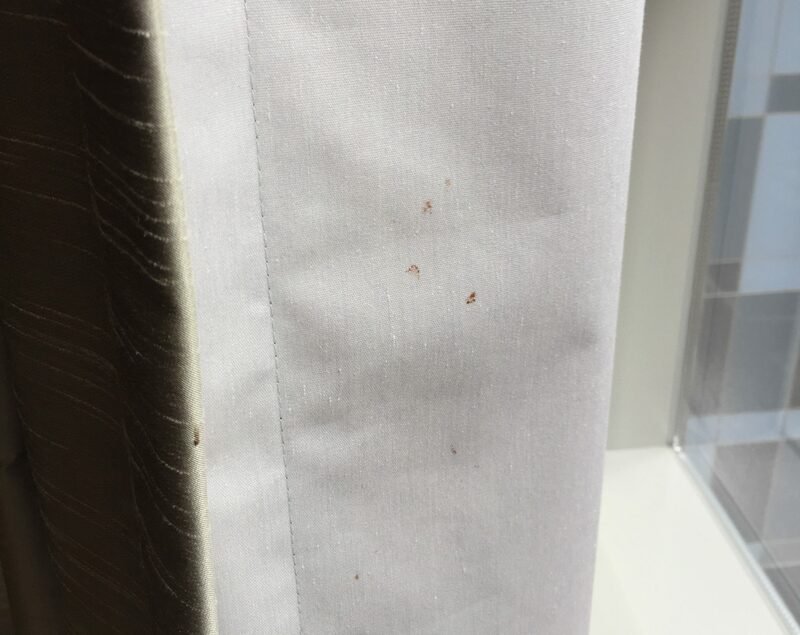 So I was a bit surprised to find a few mysterious brown spots on the drapes without even looking for it. It’s probably coffee. Let’s say it’s coffee. Or what appeared to be toothpaste residue accumulated in the coasters in the bathroom. Considering the bathroom was spotless except for the dental grime on both coasters, this might be a management training oversight rather than the fault of the actual housekeeping team. 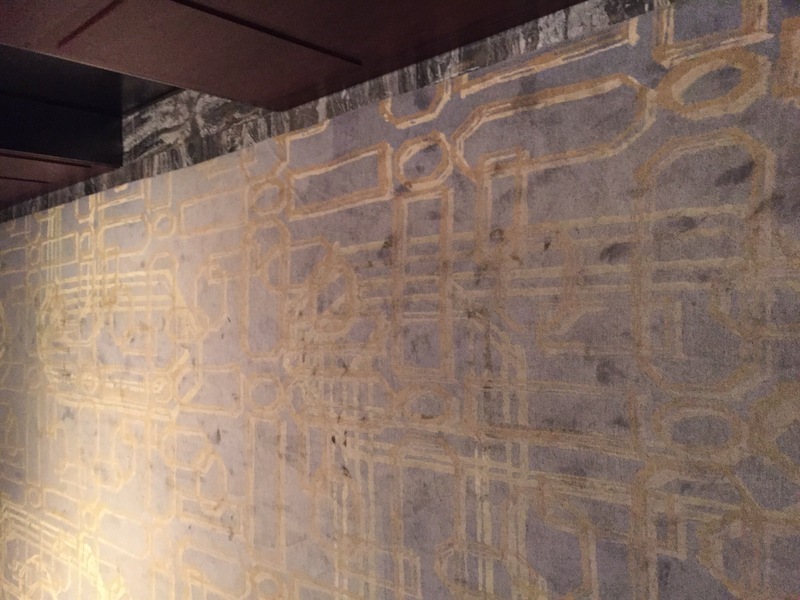 Or the dirty footprints that mysteriously found its way up to the third-floor elevators, despite guests and visitors having to traverse multiple rugs, doormats, and carpeted areas before ever getting there. I also experienced a few tech-related hiccups. 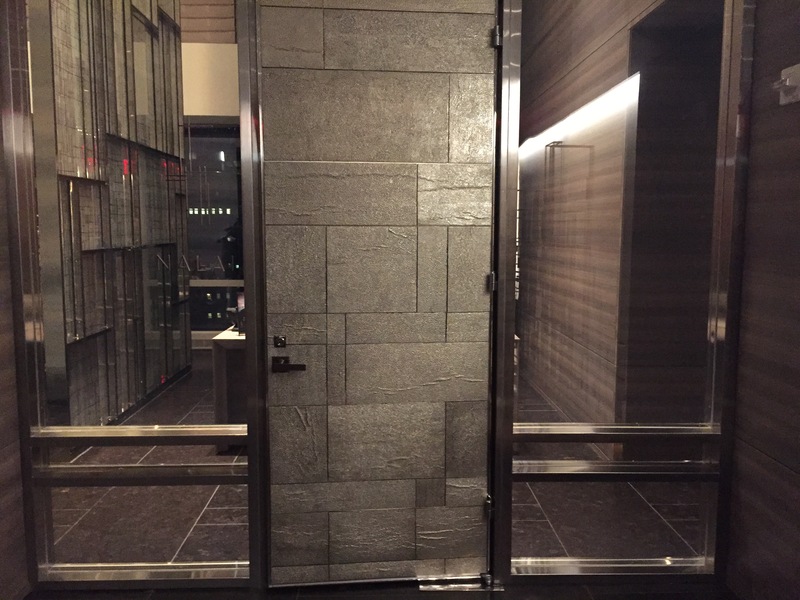 I know the Park Hyatt New York has spent a lot of time, money, and effort into making this property competitive with some of the more connected/techy hotels of the world, but I guess that inevitably opens the door for more things to go wrong. 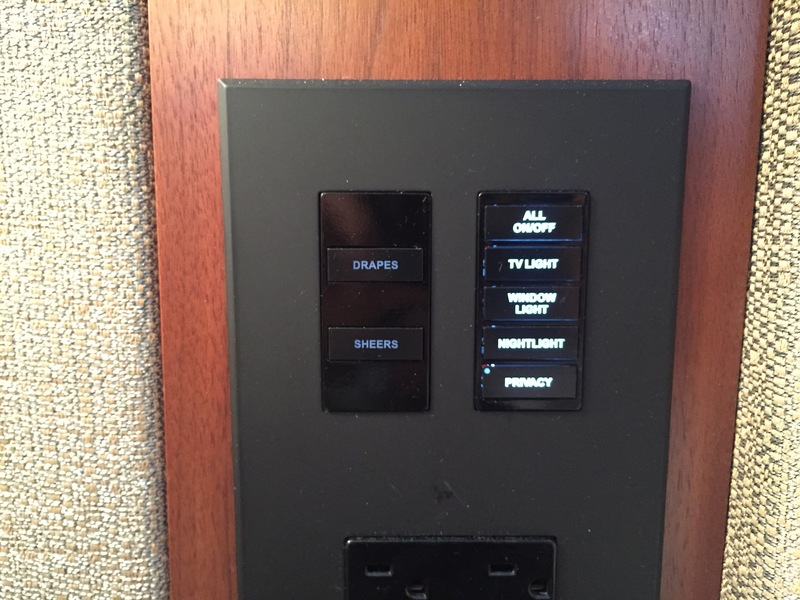 All of the lights and drapes in the room are controlled electronically, with a button dedicated to each area. You actually have to press and hold these buttons for a while to turn the lights off or on. This took some getting used to (lots of double-pressing and oops, I didn’t mean to do that!). It also only worked with just the right amount of pressure, as sometimes the buttons never activated at all. 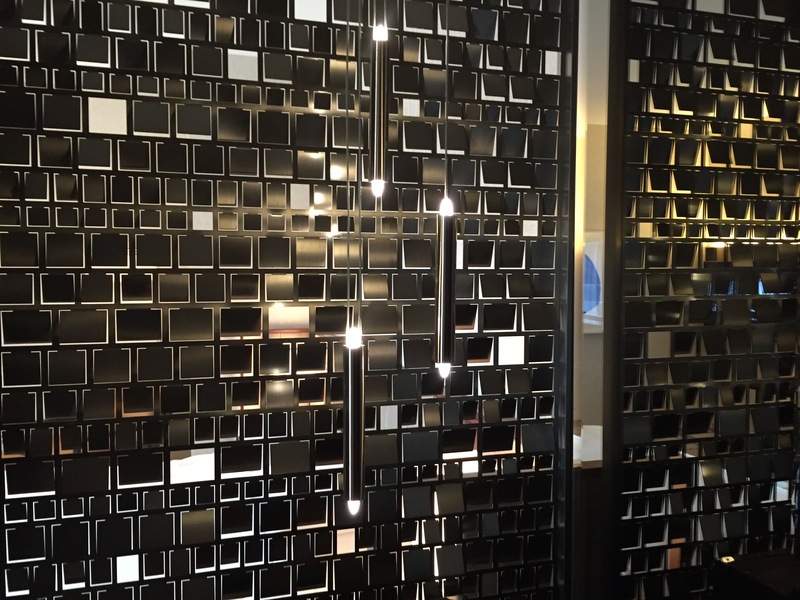 The motion detectors in the bathroom I mentioned earlier? Well, the fun wore off pretty quick when all the lights shut off while I was showering (twice), leaving me to hop around in near-darkness trying to get the lights back on. 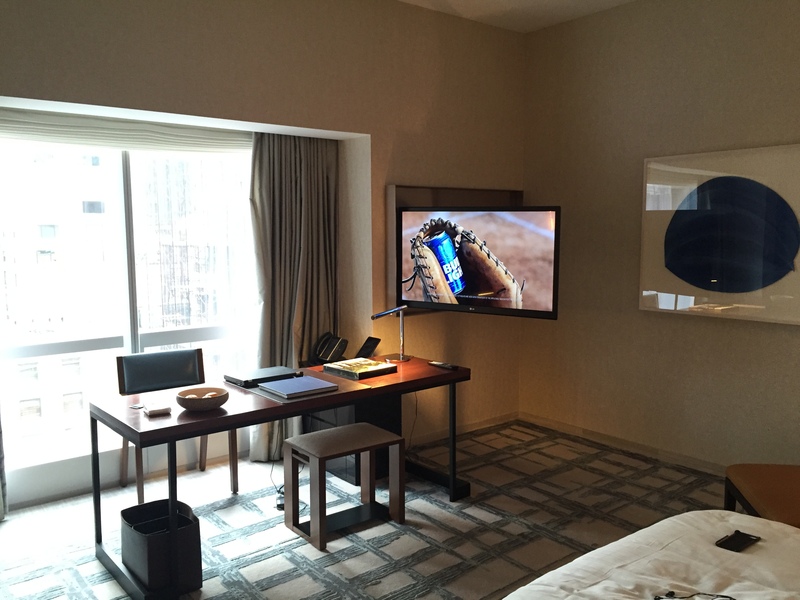 The iPad itself, while novel in a hotel room, seems rather pointless. 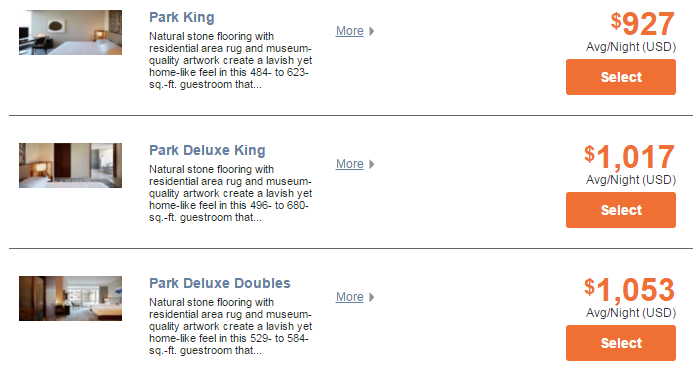 It takes several clicks to do what should be a quick call to guest services. For example, the interface forces you to order extra toiletries as separate items, so if you wanted a dental kit, extra soap, and another sewing kit, you’d have to “check out” each of these items individually. As I continue to grasp at things to complain about, I guess I should also mention that the black-out curtains didn’t really black everything out. The ever-present lights of the city peeked through the sides of the curtains, and together with the soft glow of the touchscreen phone, iPad, and ambient light from the switches, you might find it a bit difficult to sleep if you prefer slumber in pitch darkness. While the room’s walls seemed well sound-proofed, the doors leading to the hallway were decidedly not. It was a bit unsettling to lay in bed and hear respectfully-hushed conversations floating in through the entry-way as if passer-bys were carrying their conversations right at your bedside. In terms of service, everything seemed a bit less personal, or at least less proactive, than what is customary at other five-star hotels. Again, this worked great for me, but it might rub you the wrong way if you’ve somehow made it in life to become accustomed to assistance with bags, someone showing you to your room, a welcome note and amenity, everyone greeting you by name, and so on. There were also a few missed opportunities to provide exceptional service, beyond what any decent, well-adjusted human should expect – but is often lavished upon guests at high-end establishments anyways. For one, when I arrived back to the hotel after my long run, undoubtedly disheveled and close to crawling through the lobby, I found the lobby water cooler out of fresh glasses. In my dehydrated confusion, it took a while to find someone to ask for water. When I finally did, I was handed a single lukewarm bottle from the back after pacing around a bit in the lobby. Did I need water? Yes. Did I get water? Also, yes. So what’s the problem? Well, there’s none, really. But when coming back from jogs at other hotels, including mid-range hotels, I’ve often been proactively offered a chilled bottle of water and towel. In fact, this has happened so reliably that its absence at a property as prestigious at the Park Hyatt New York was all the more noticeable. 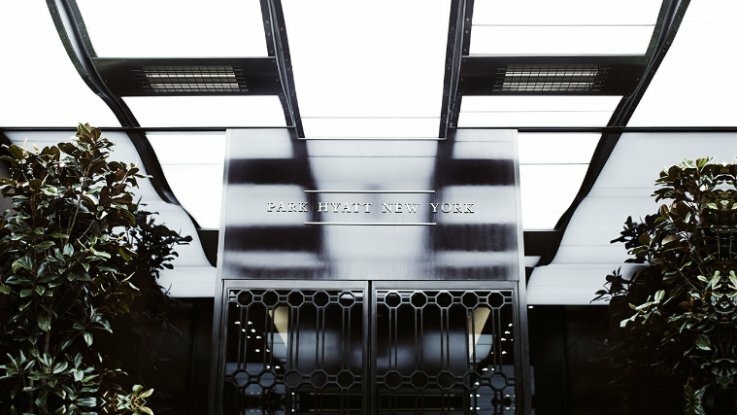 Coupled with longer-than-usual waits for check-in and miscellaneous room requests, and everything else mentioned here, this Park Hyatt might’ve ever so slightly missed the mark on providing extraordinary service above and beyond the competition – if that is, in reality, the goal of this property after all. Let’s be real. Did these minor quibbles in any way affect my stay? Of course not. 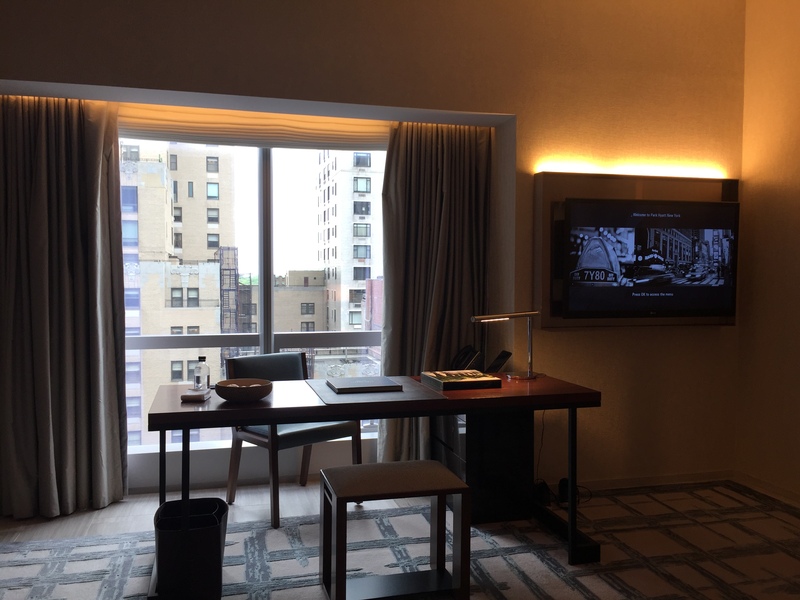 Overall, I had a fantastic experience at the Park Hyatt New York, mostly due to the still-brand-new and thoughtfully-designed facilities of this hotel. But did it bring some insight into the impossibly vague question I posed at the beginning of this review? In a way, I think it did. 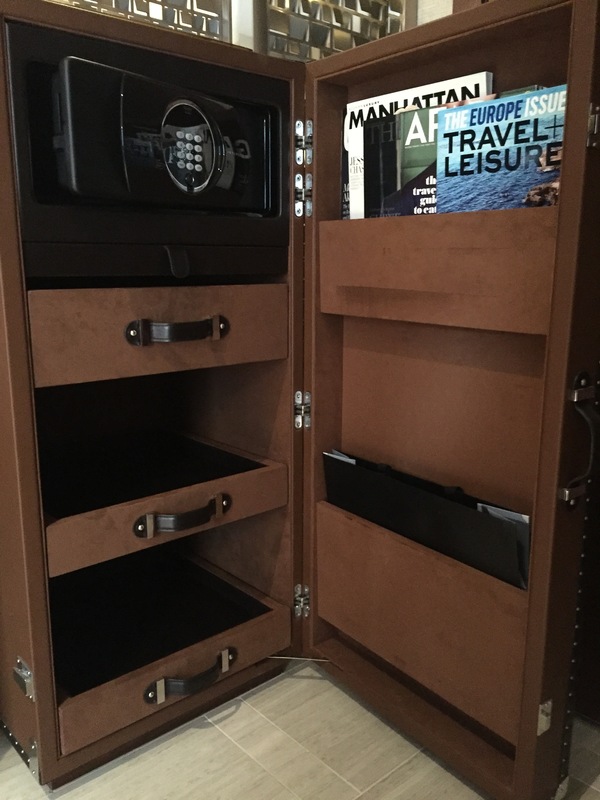 I discovered luxury is almost invasively personal. It’s being taken care of when you didn’t even realize there were things worth caring about. Ever lament how uncomfortable it is to step on a cold surface after a hot shower? Or maybe how damn inconvenient it is to have to wipe away the fog from a mirror after your bath? But when you’re treated with floors warmed to the exact degree of your choosing and when your mirrors de-fog for you, you pause – because you notice. For better or for worse, but probably worse, luxury is also exclusive. Sure, all five-star hotels have nice sheets and feather pillows. 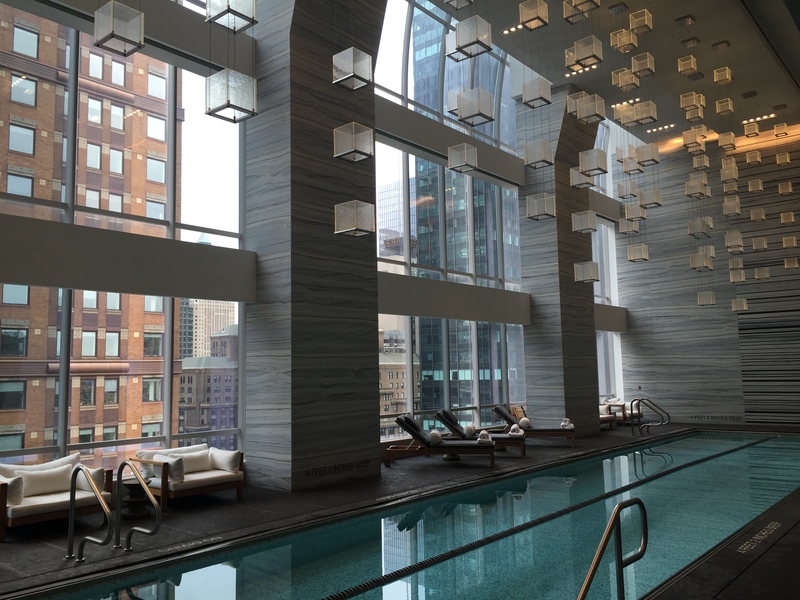 But how many places in Manhattan can you get sweeping views of the city while stepping out of an indoor Olympic-length swimming pool? How many hotels in the world have pools with underwater speakers? Do you even need underwater speakers? Who cares, because you have them here! And lastly, I should mention that luxury is relative. Some might’ve been a bit put-off by what I viewed as minor cleanliness or service issues. Others might not give TV’s in bathroom mirrors a second glance. But for me, everything was just fine. 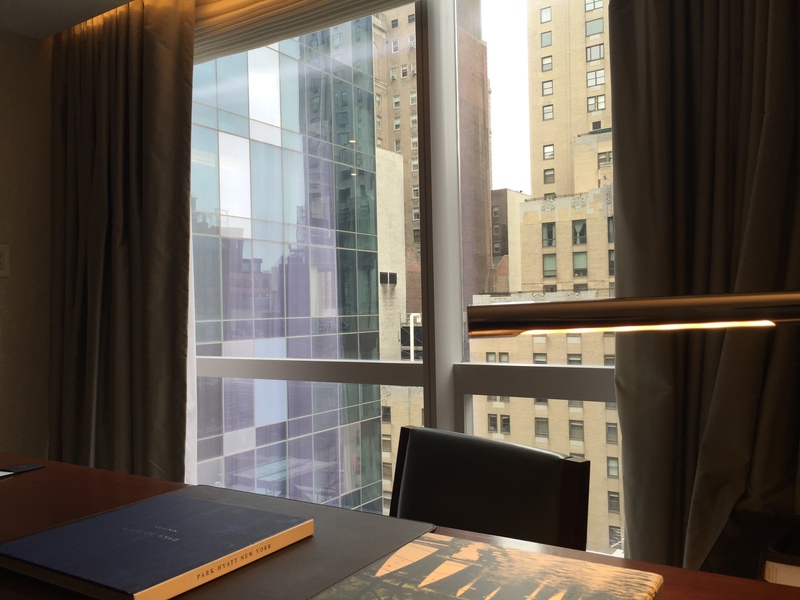 The Park Hyatt New York sets a new standard for hotels in New York City, if for facilities alone, and yes – a new standard for luxury too. Love the Halal guys! When we visited my sister, husband and new baby last year (staying at Hyatt Times Square). He went and picked up lunch at Halal guys for us. So, so good!!! Nice review. Probably will never stay here because we rarely travel without our two children, and I don’t think they have rooms for four (I could be wrong). Sounds like a nice hotel, though. You know what would be luxury. A clean hotel pool. I’ve stayed at some pretty nice hotels, and there is almost always something yucky about the pool. 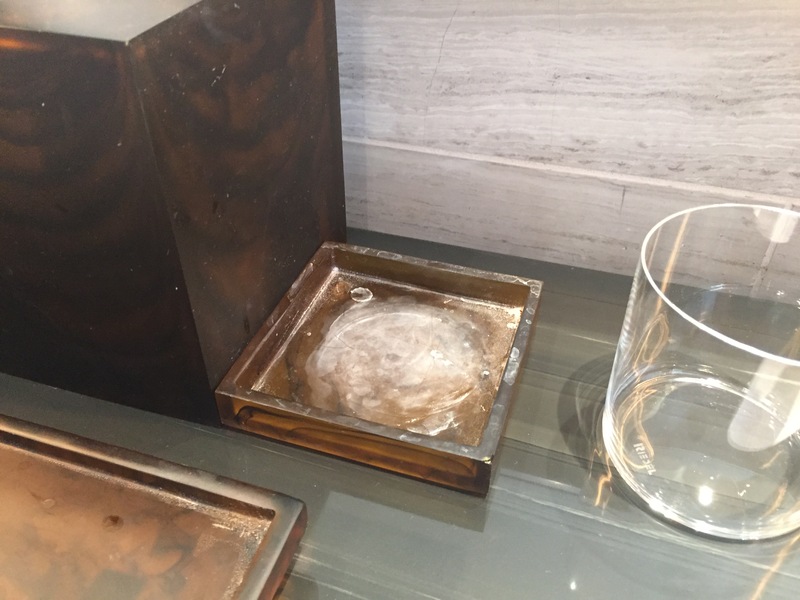 (I don’t look for dirt either and probably have a lower standard for cleanliness than your usual luxury hotel and restaurant guest, but I also can’t help but notice things that most people don’t see. And are probably better off not seeing, frankly.). I bet having a lifeguard there all the time helps with that, because at least there is a hotel employee there to notice things on a regular basis.